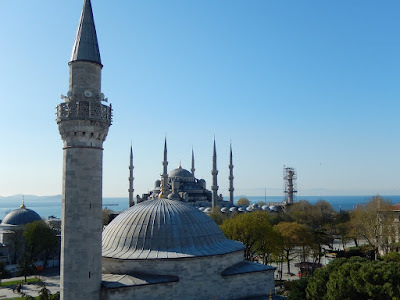 We left Finike early with our airport transfer and for $40.00 CAD each we were on a wide body jet with Turkish airlines. 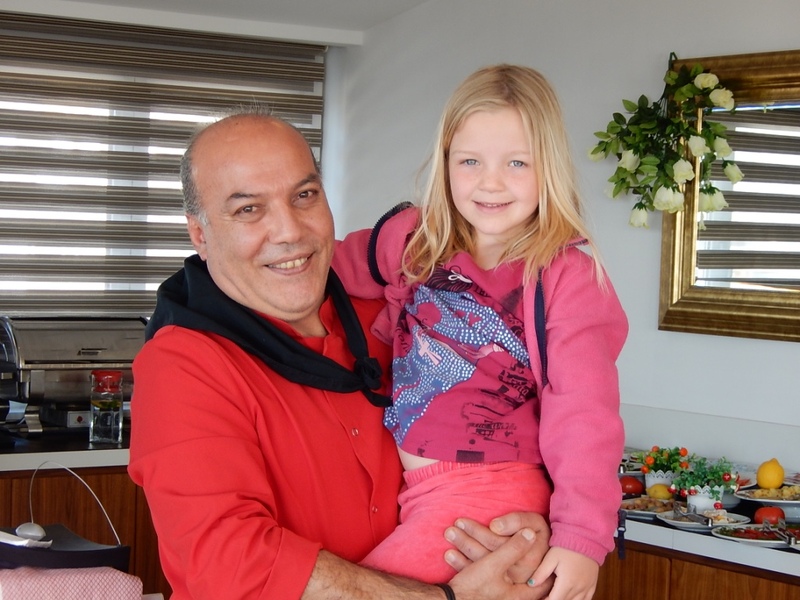 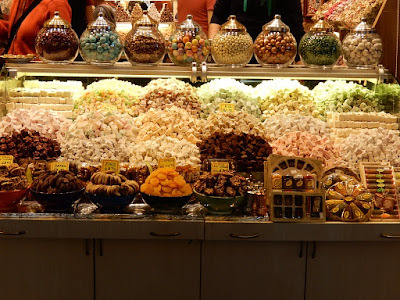 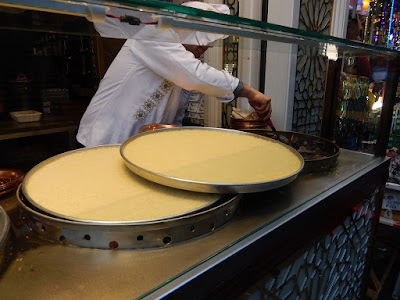 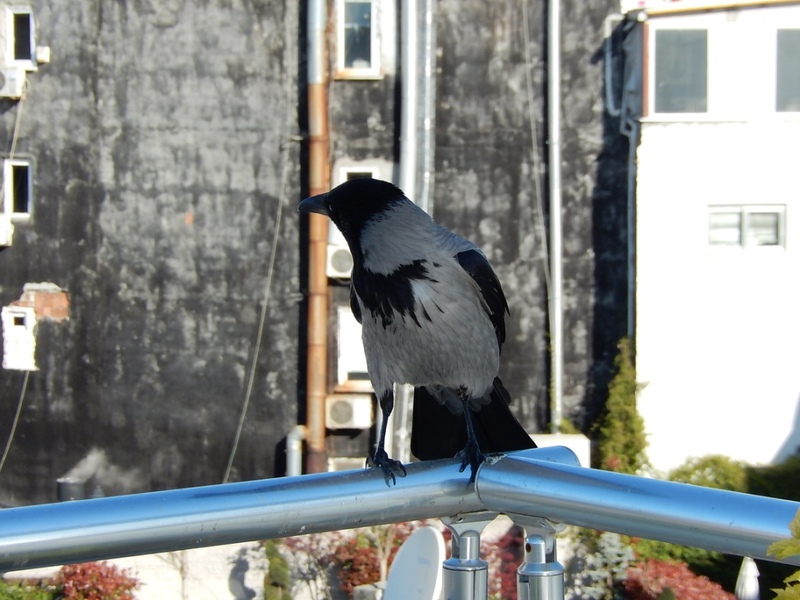 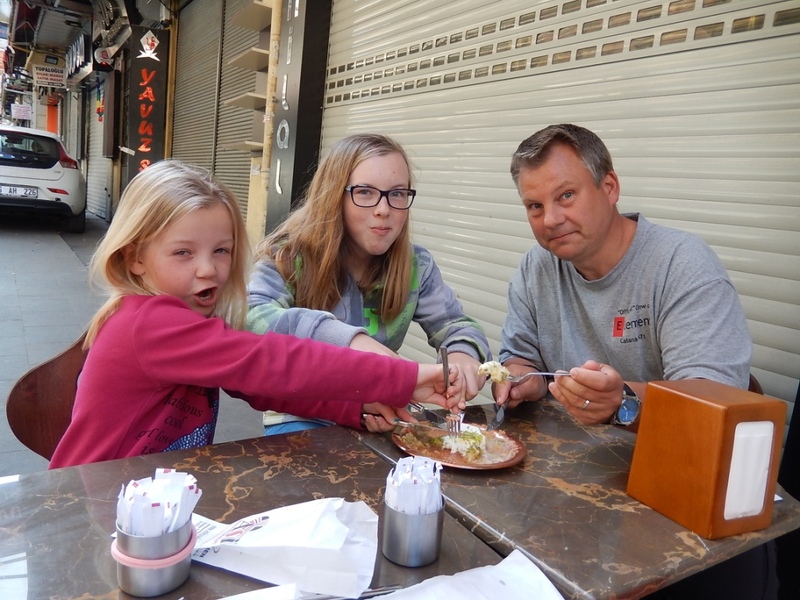 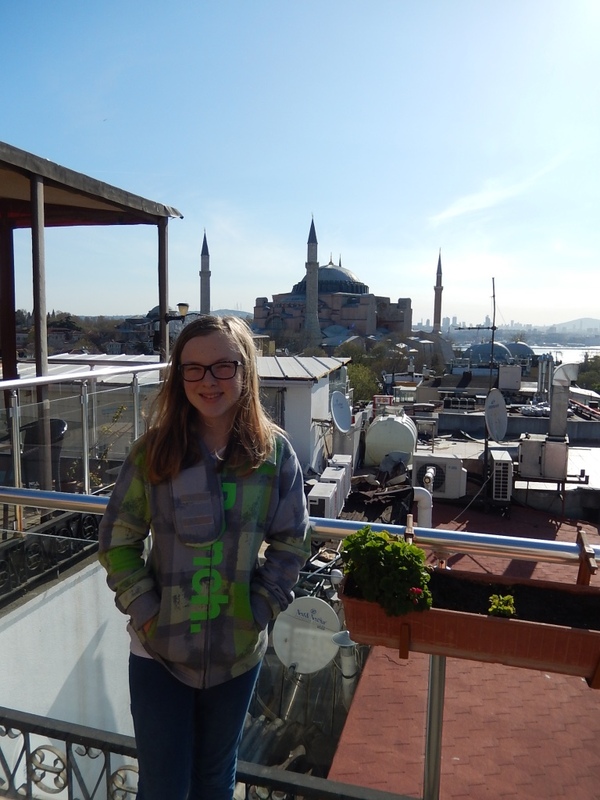 We were served a meal and drinks and arrived in Istanbul in the afternoon. 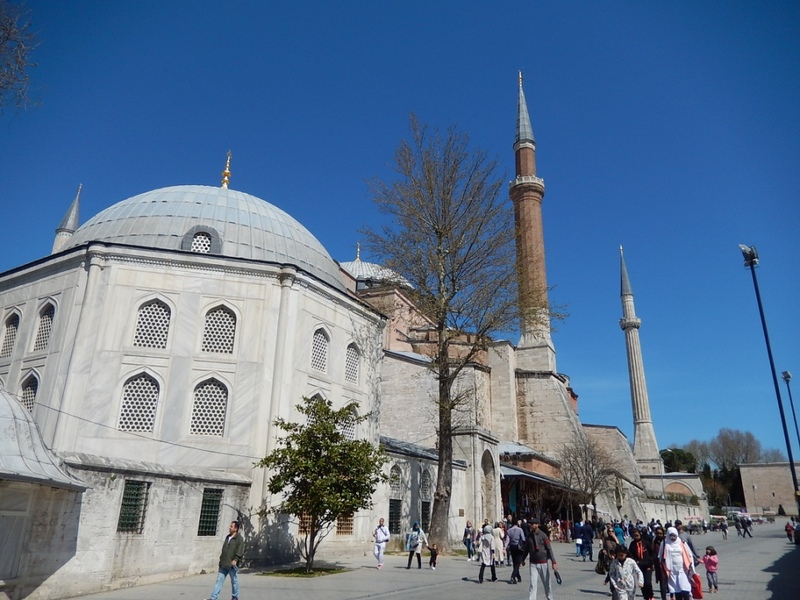 We hopped on the Metro and arrived in Sultanahmet. 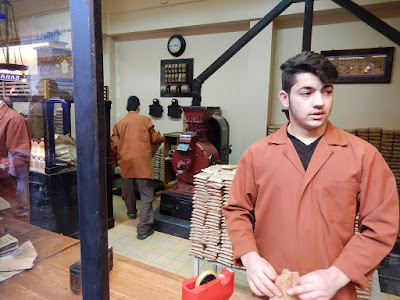 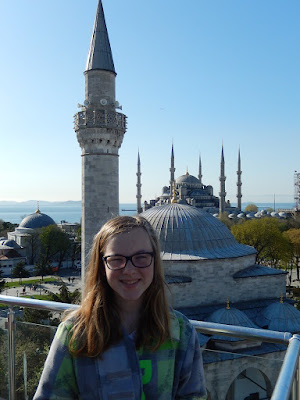 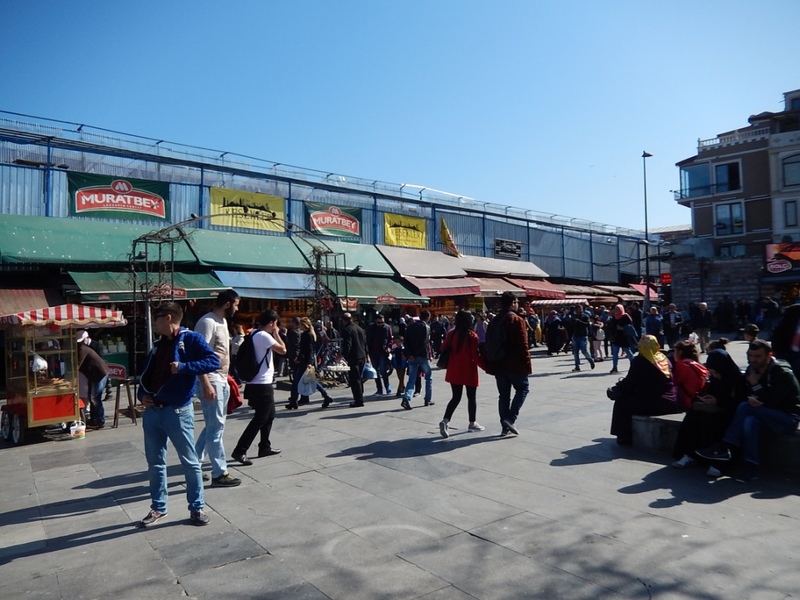 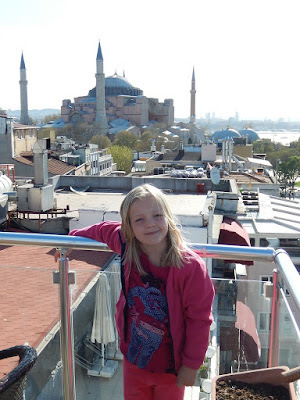 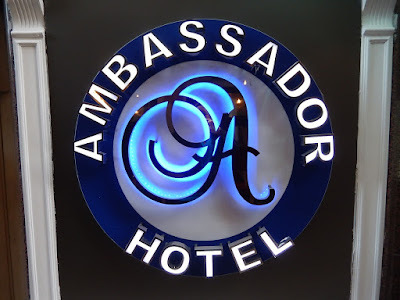 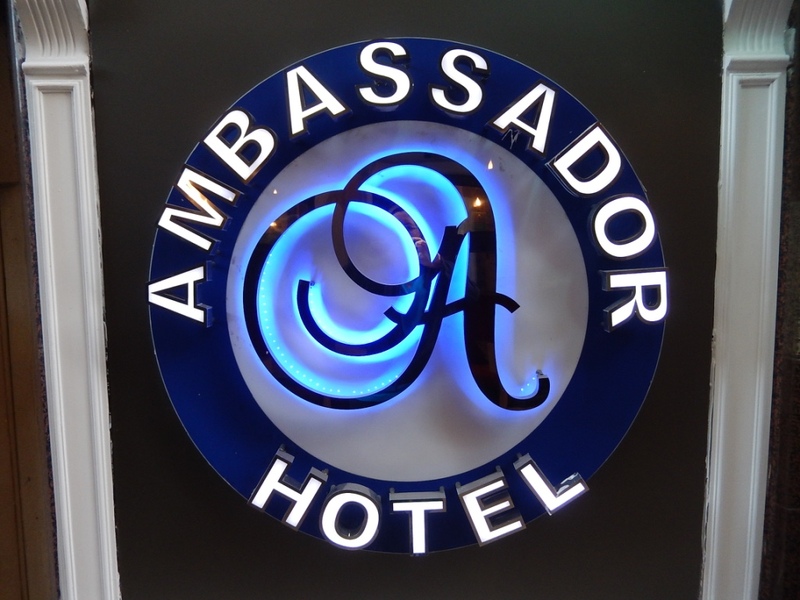 Our hotel (Ambassador Hotel) was within walking distance of many of the top sights in Istanbul. In fact from the rooftop terrace we had a spectacular view. The hotel offered a wonderful breakfast with a variety, there was something that everyone liked (bonus). 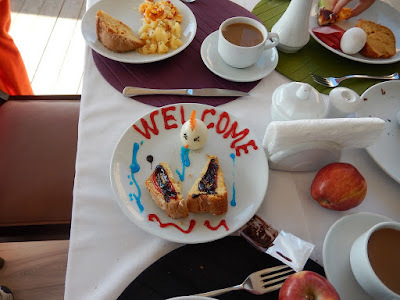 For every new traveller the chef produces a special plate. 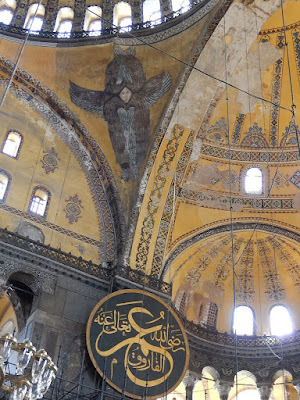 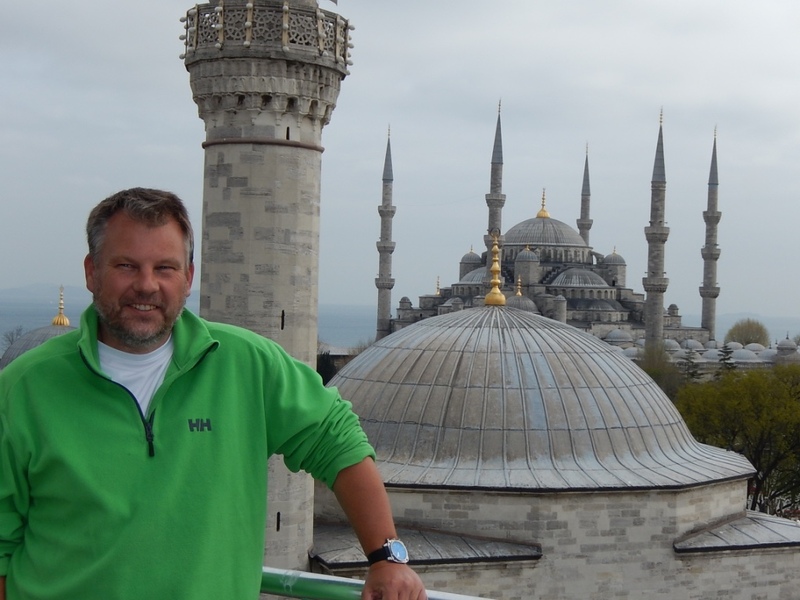 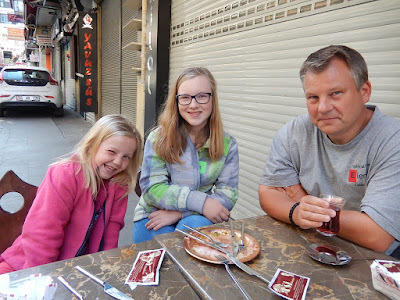 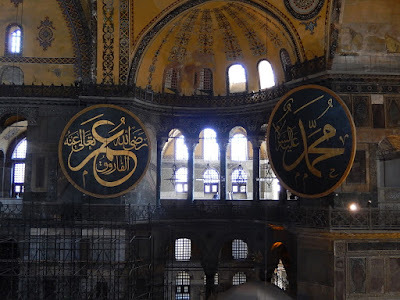 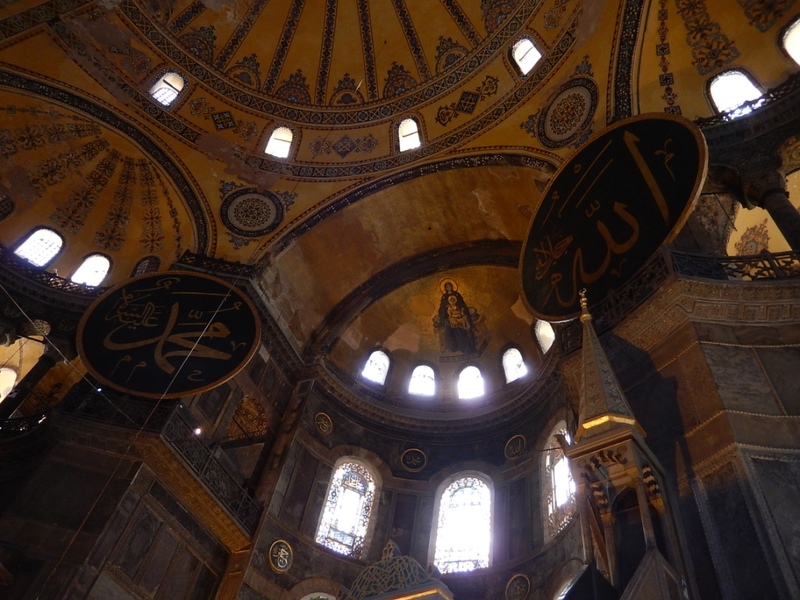 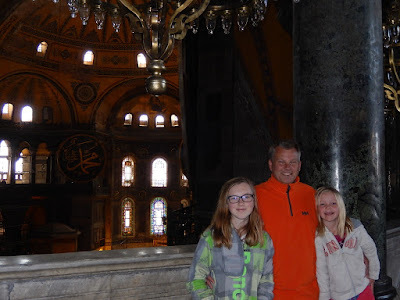 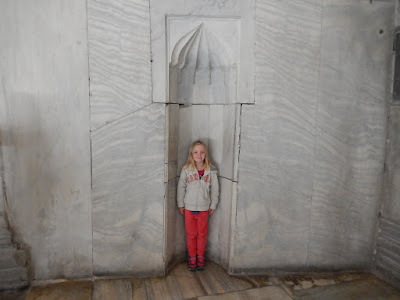 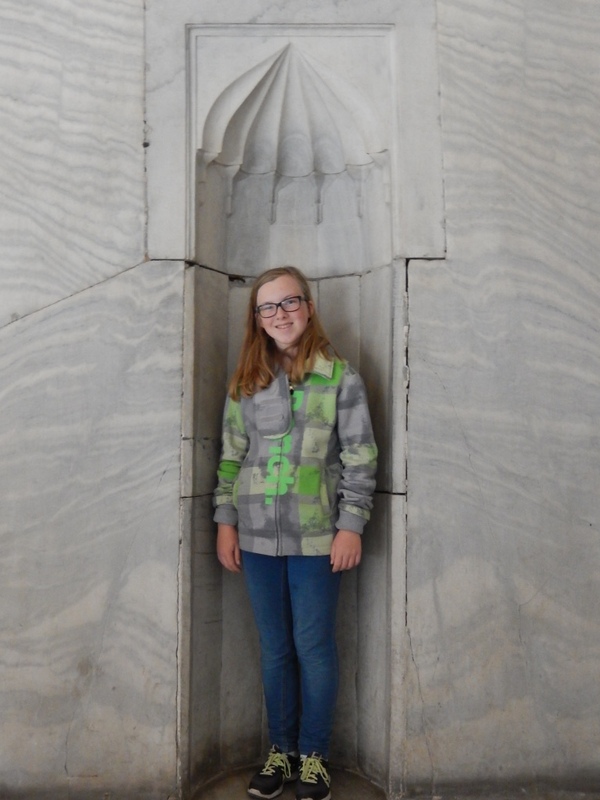 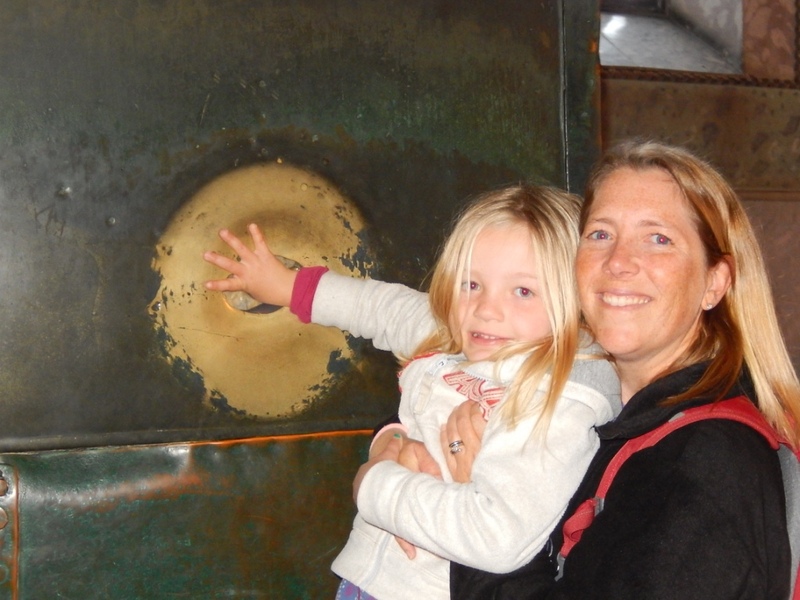 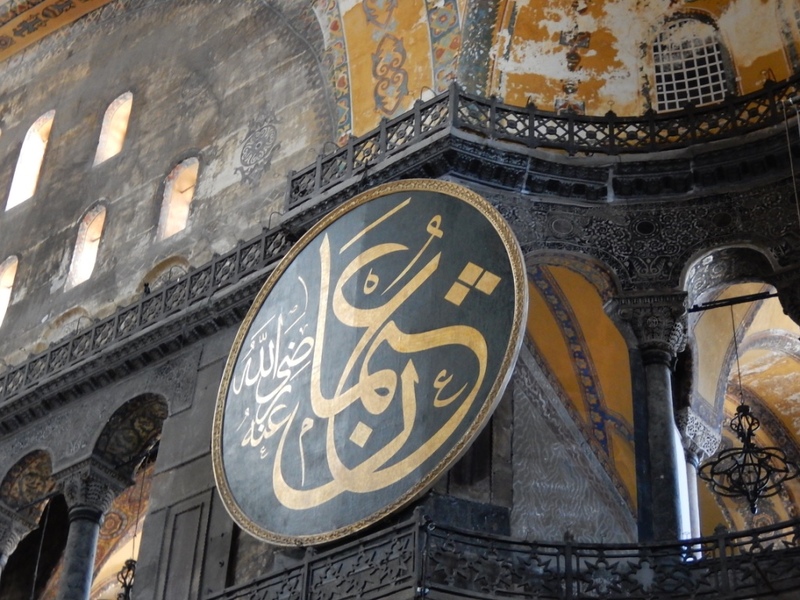 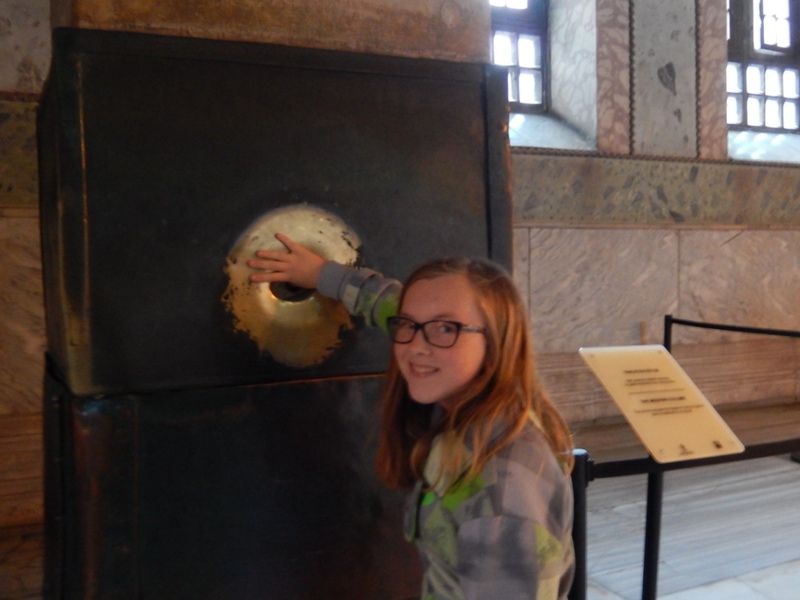 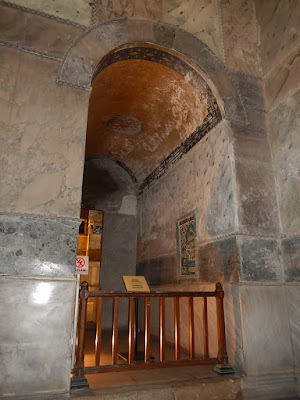 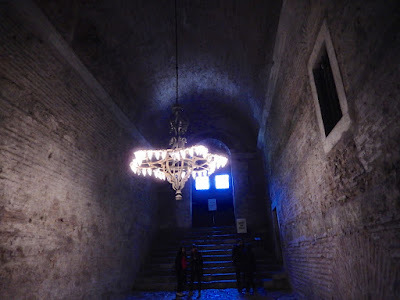 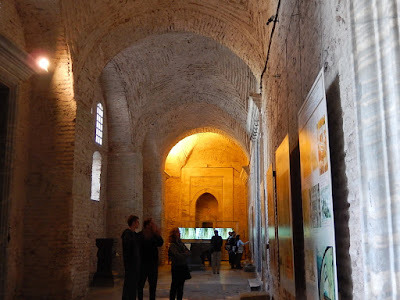 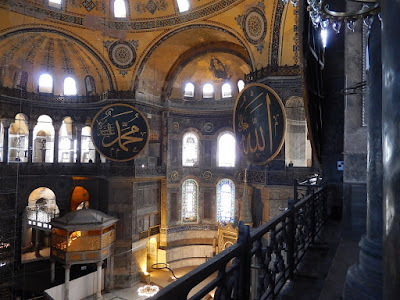 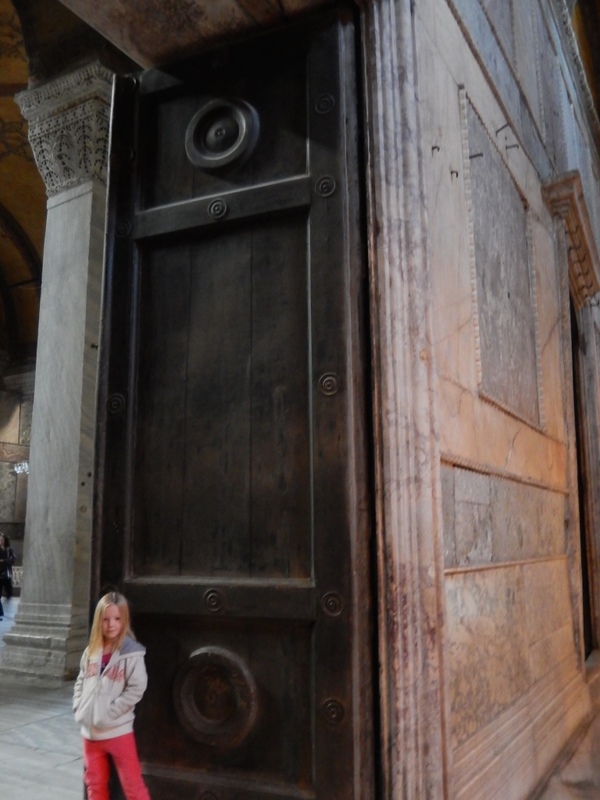 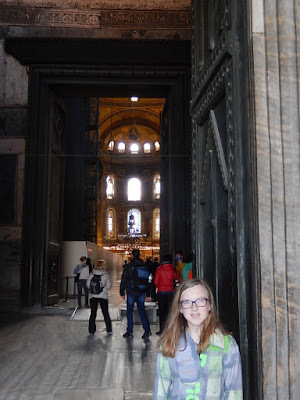 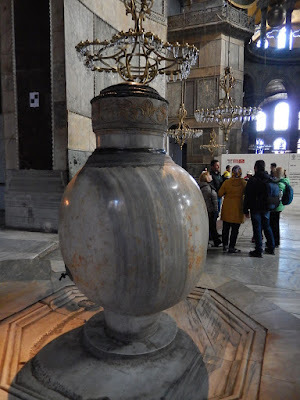 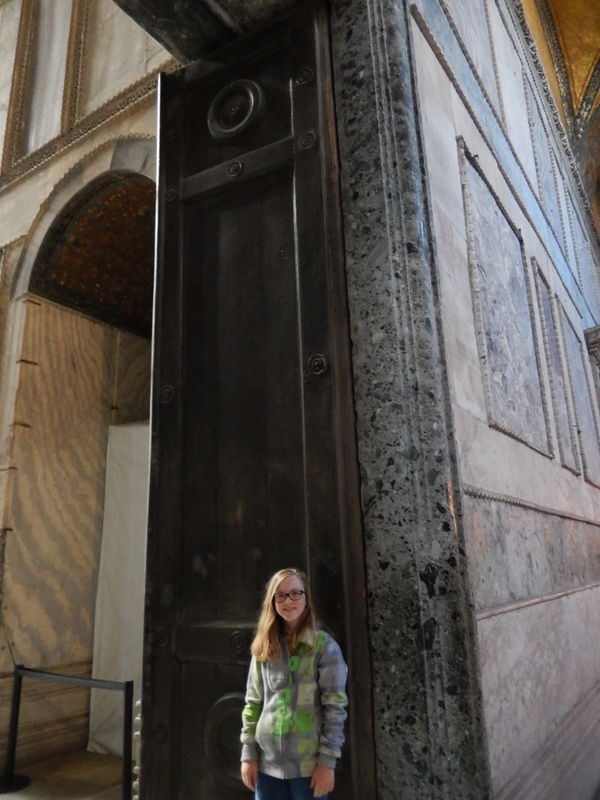 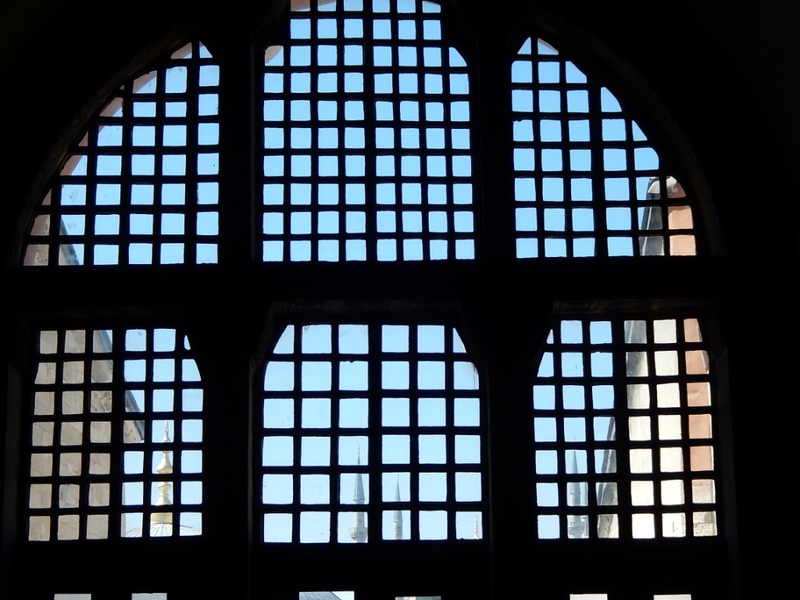 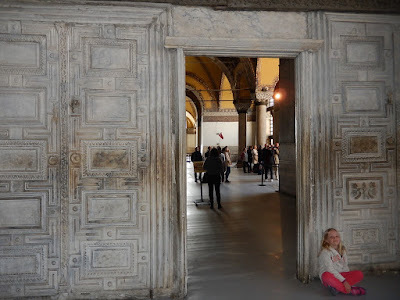 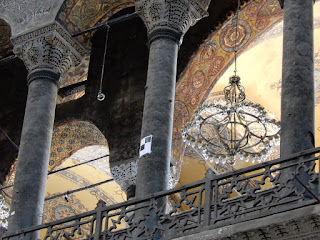 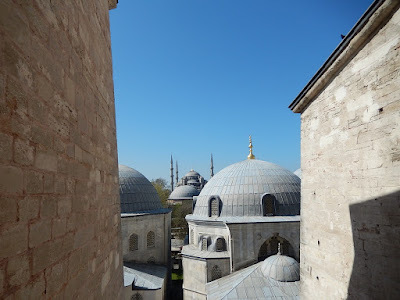 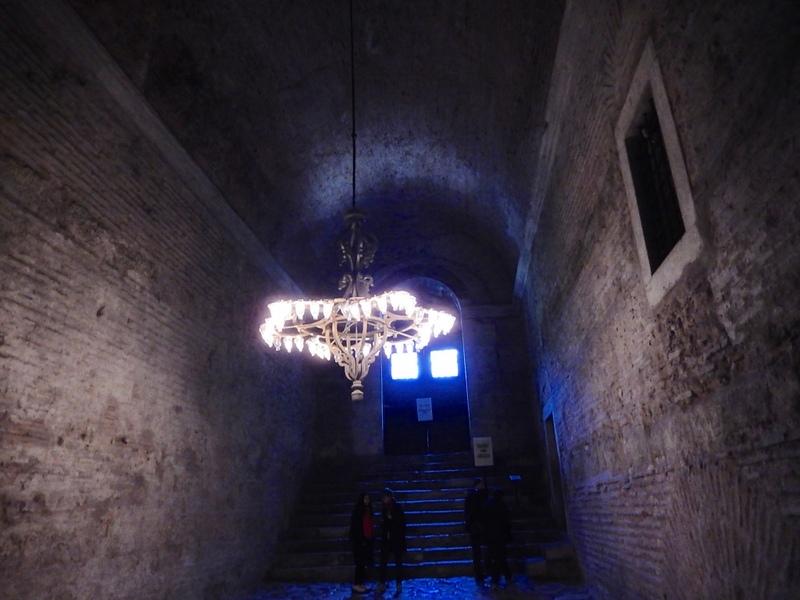 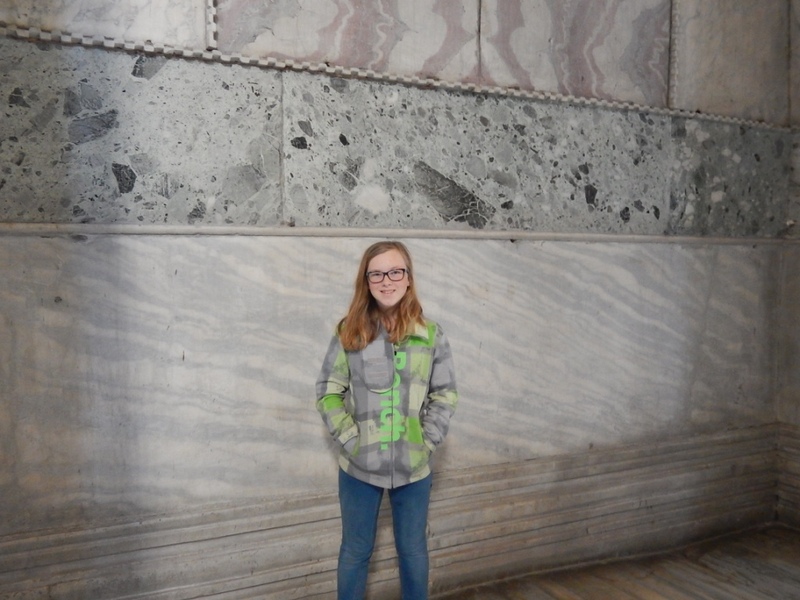 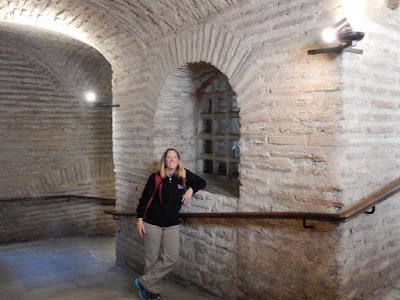 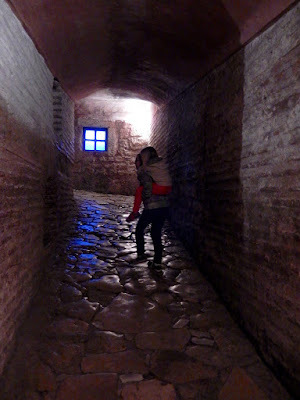 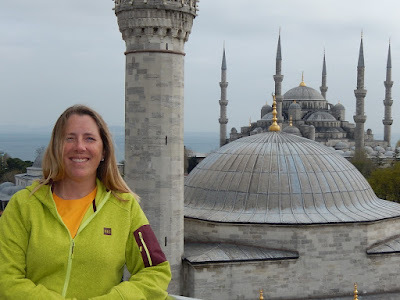 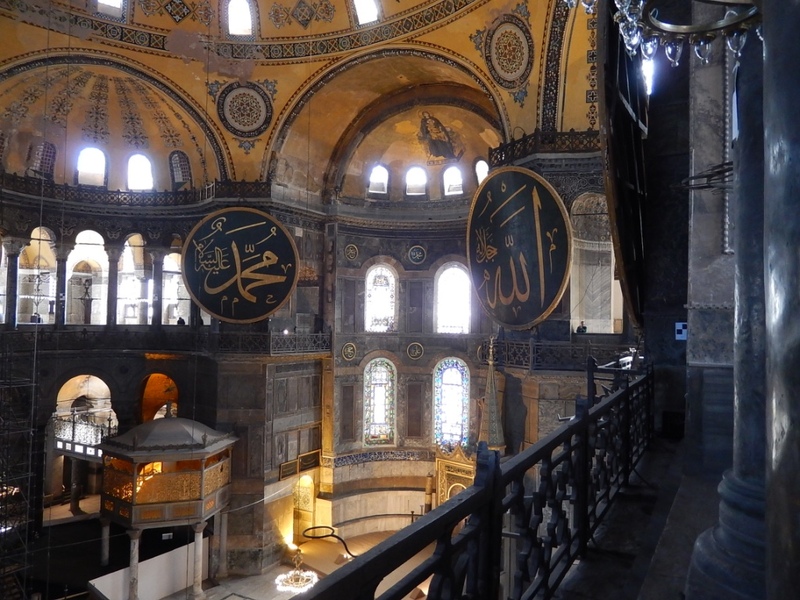 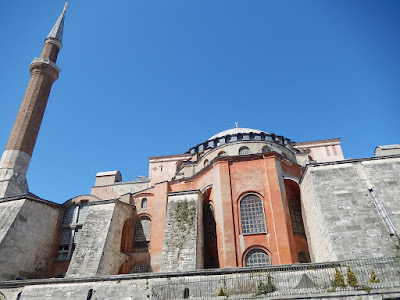 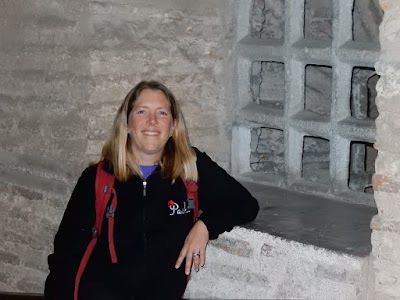 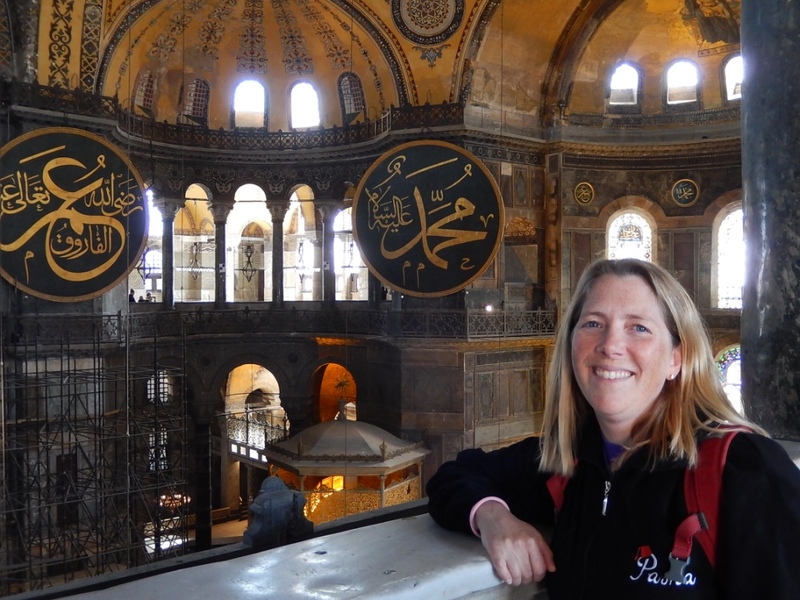 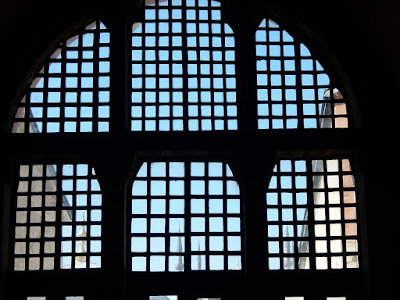 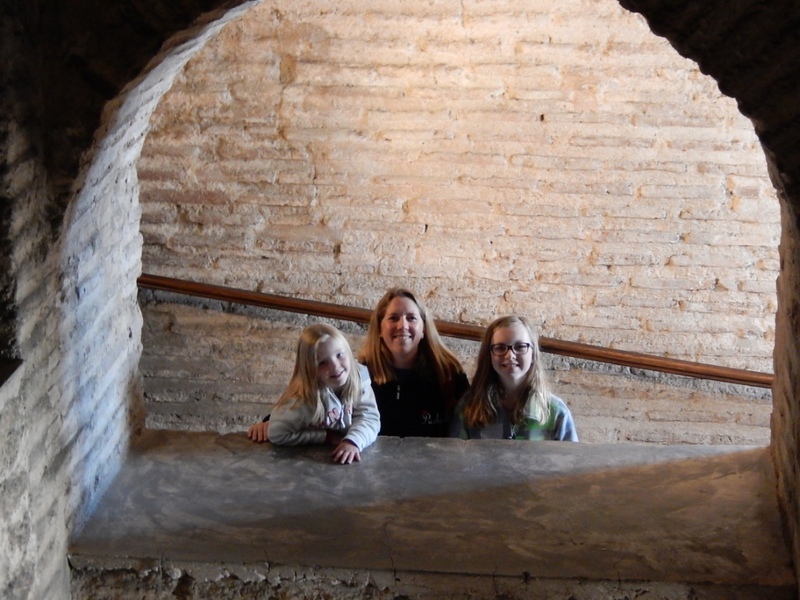 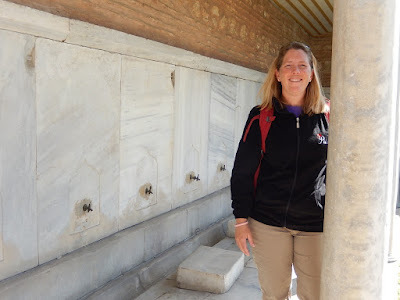 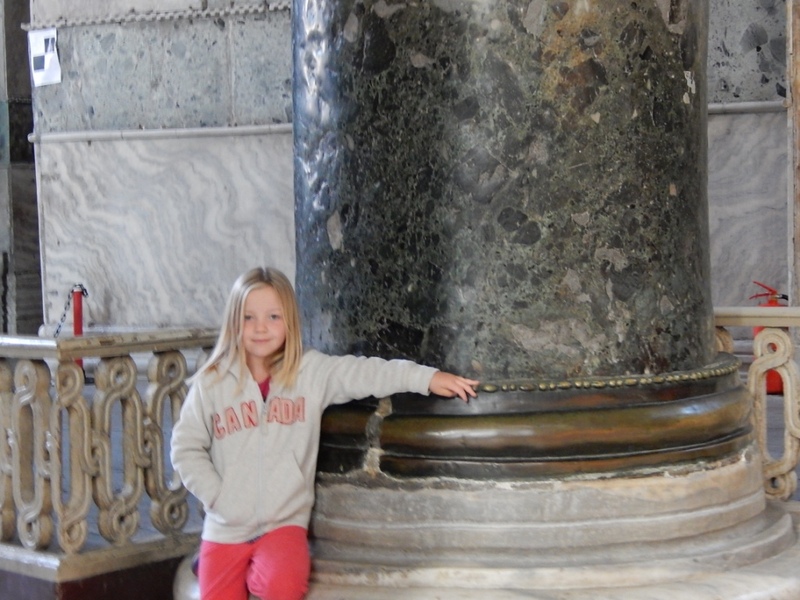 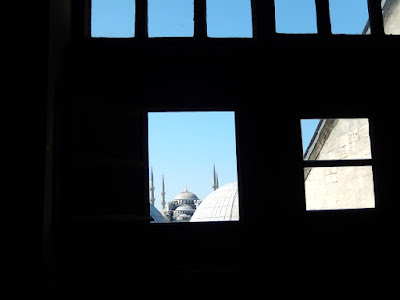 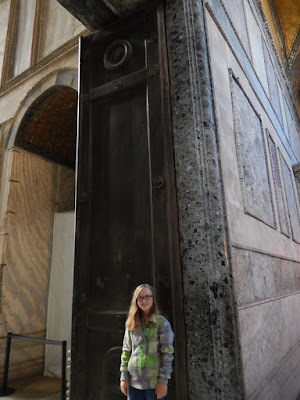 We decided after breakfast to head down to the Hagia Sophia Royal Mosque to check it out. 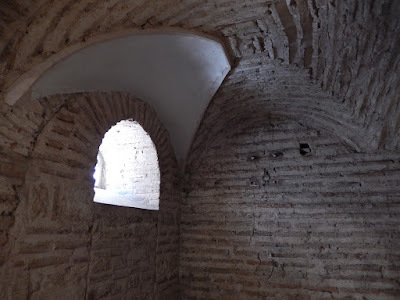 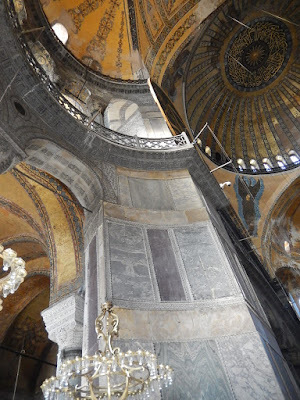 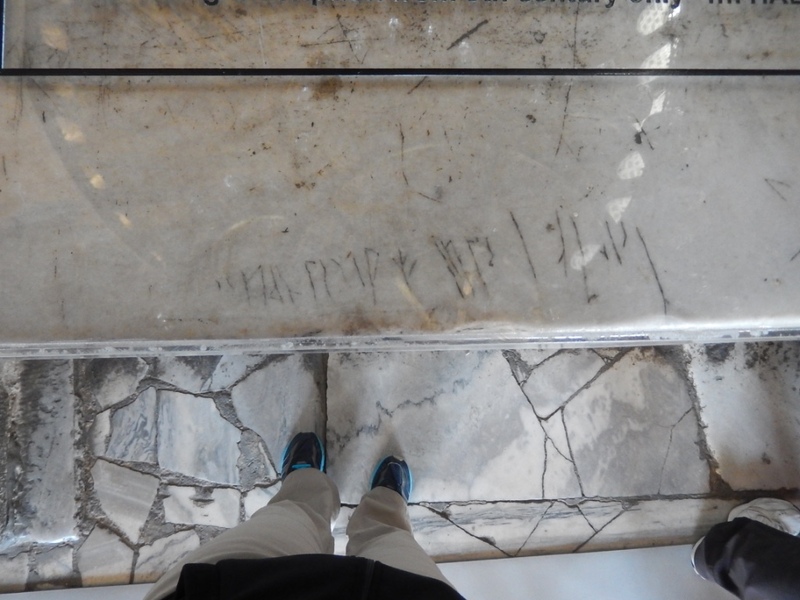 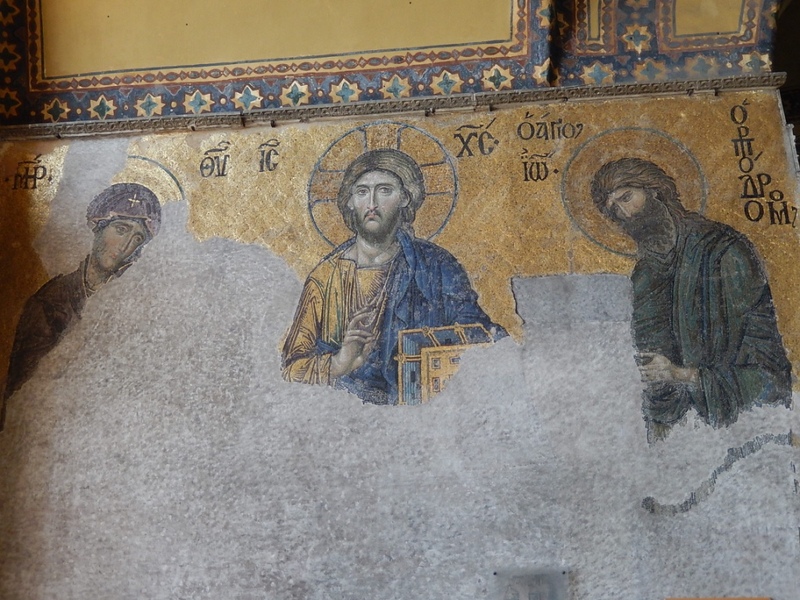 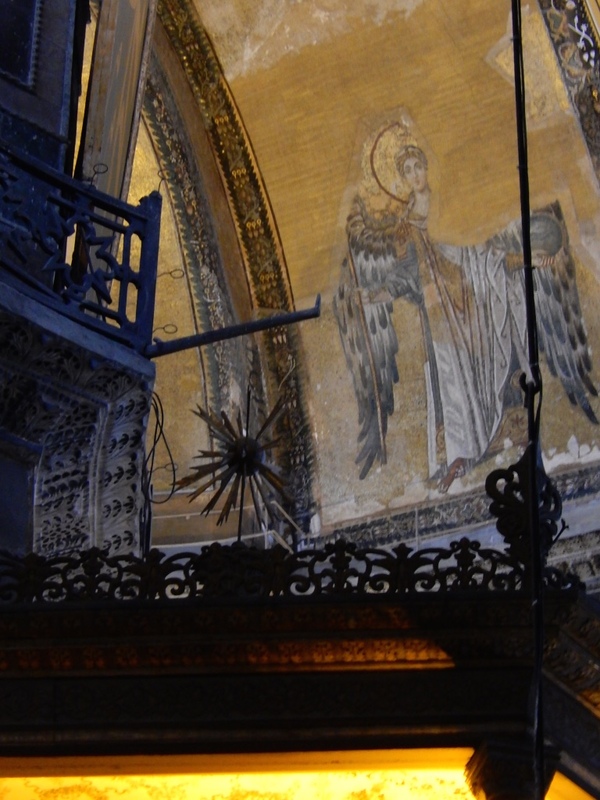 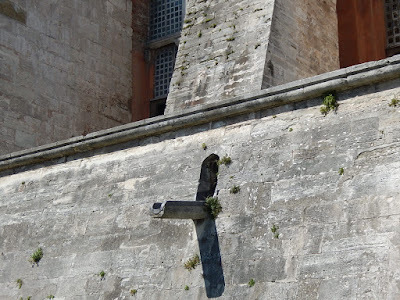 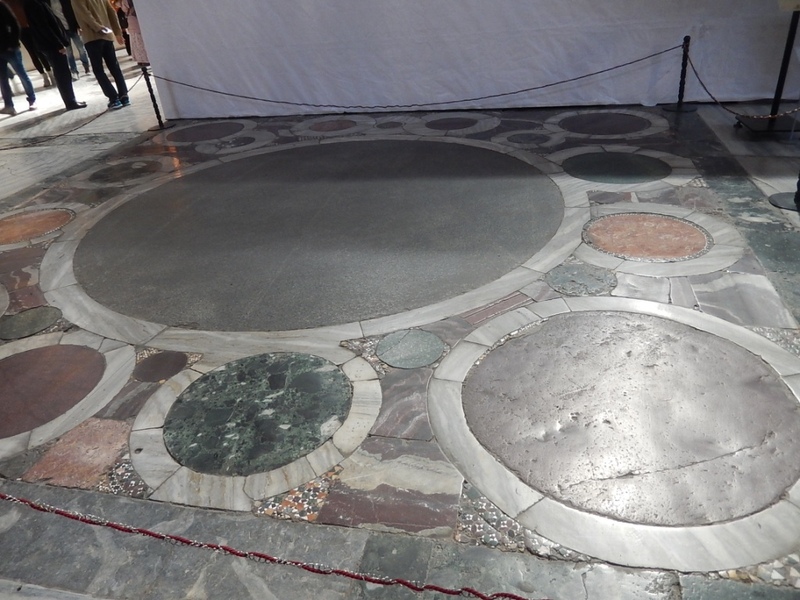 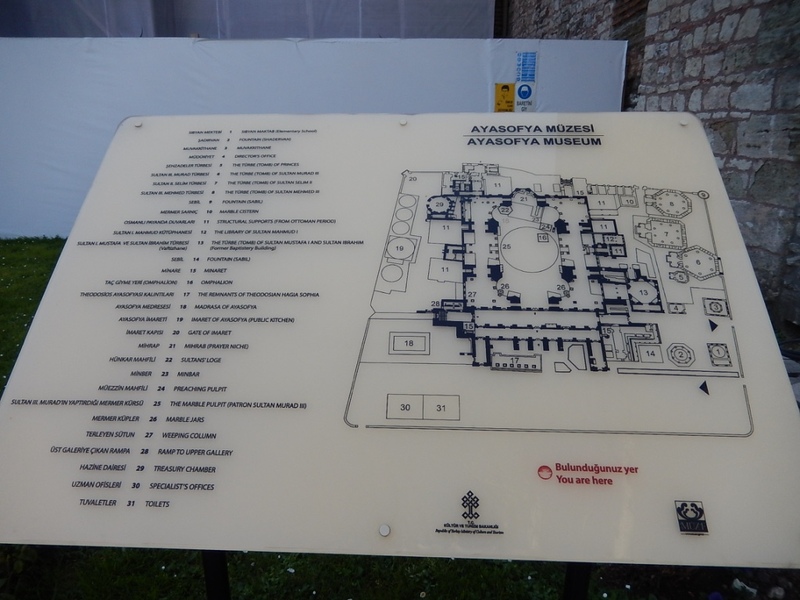 From 537 - 1453 it was a Greek Orthodox Basilica. 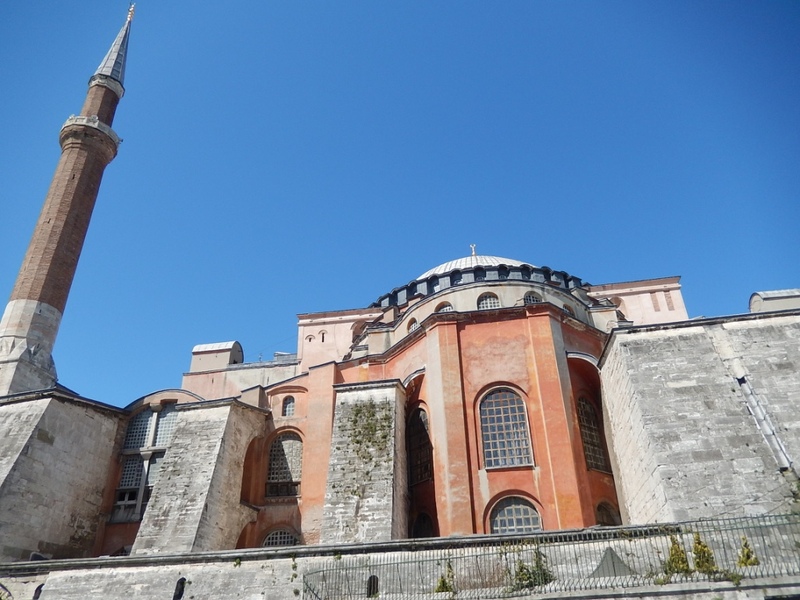 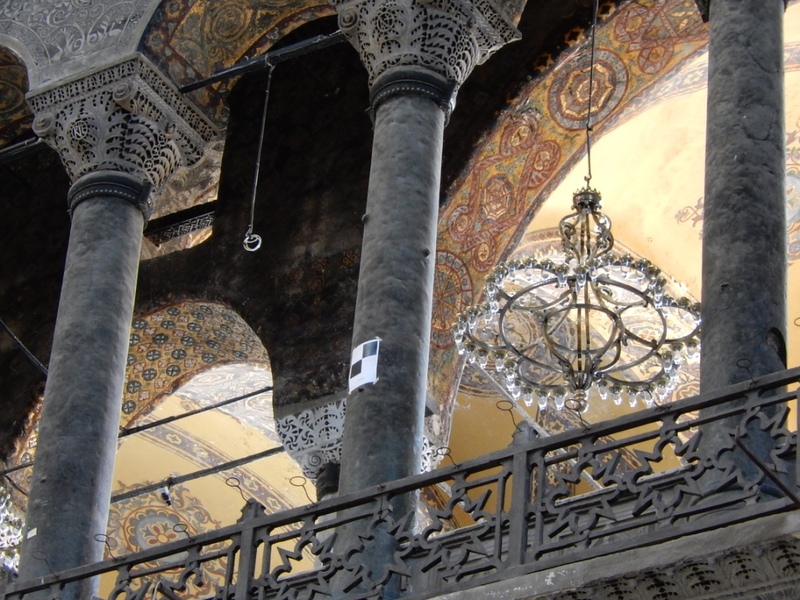 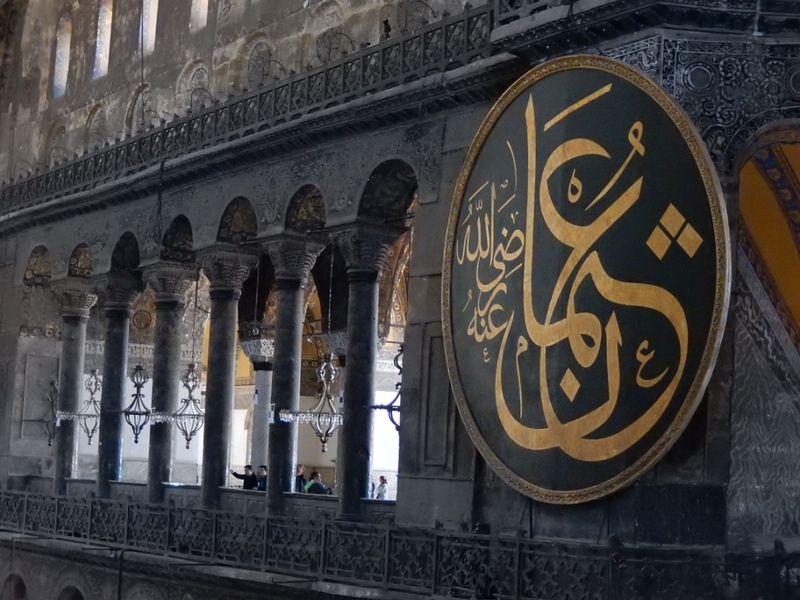 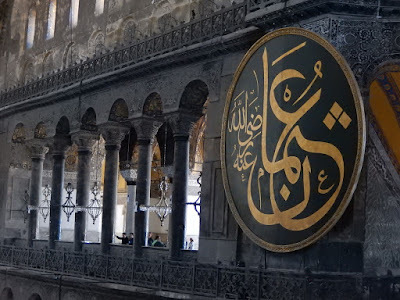 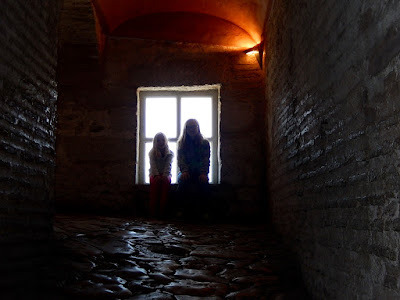 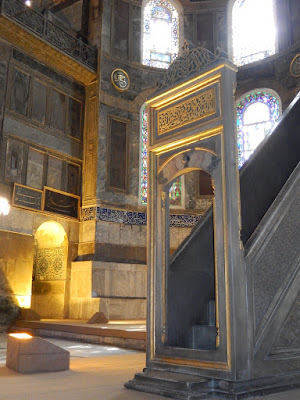 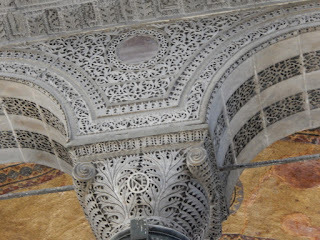 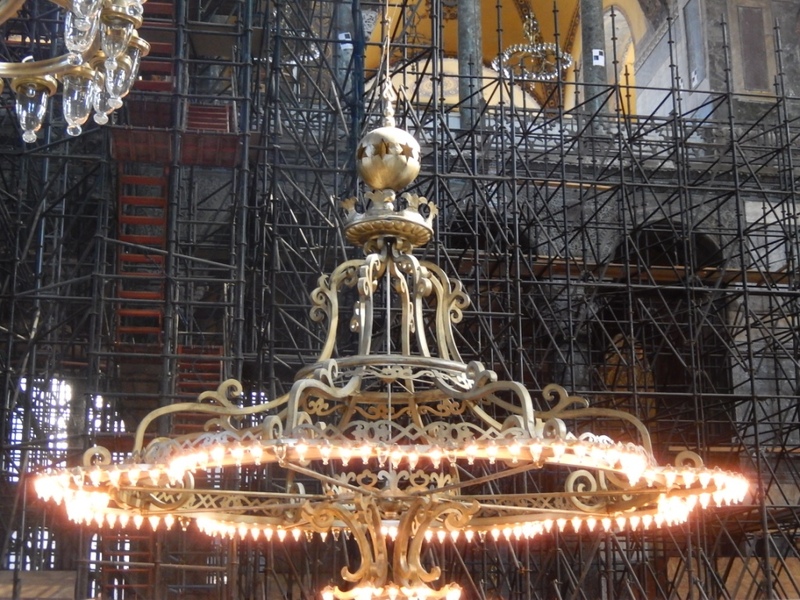 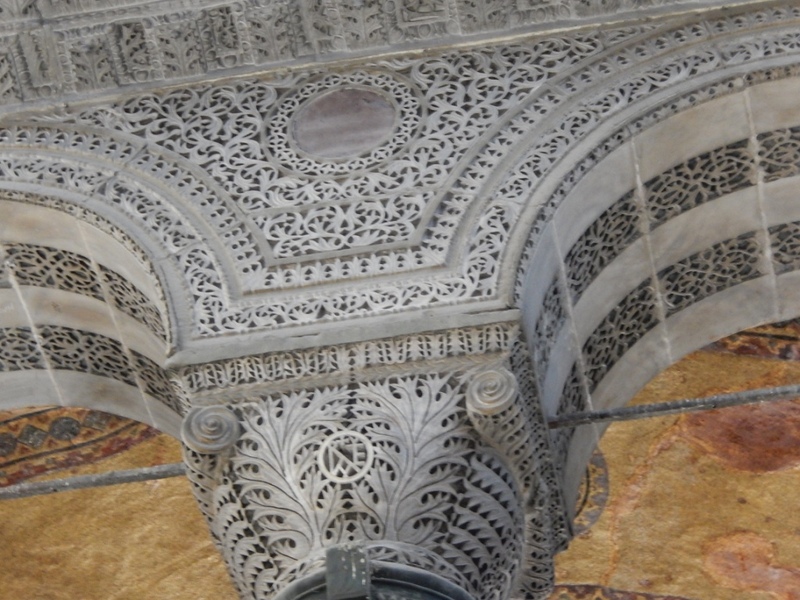 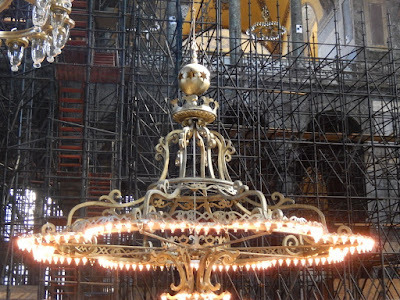 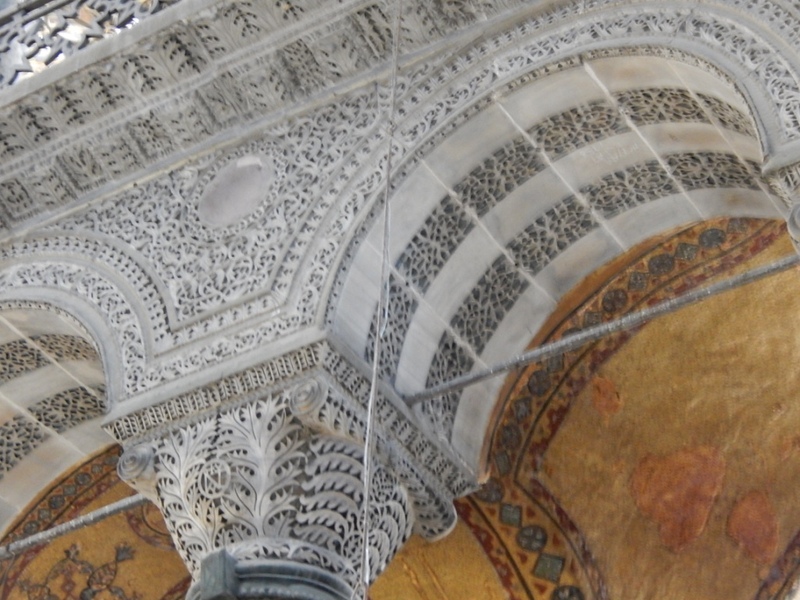 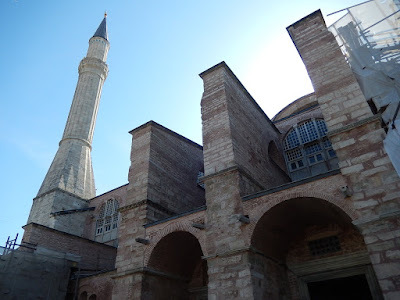 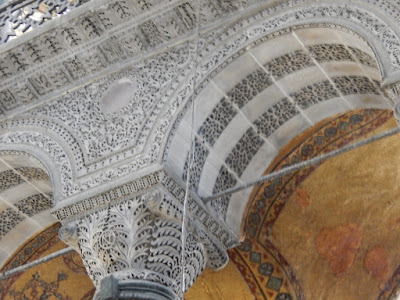 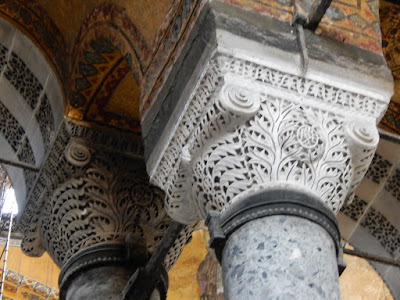 In 1453 Constantinople was conquered by the Ottoman Turks and the Basilica was transformed into a Mosque. 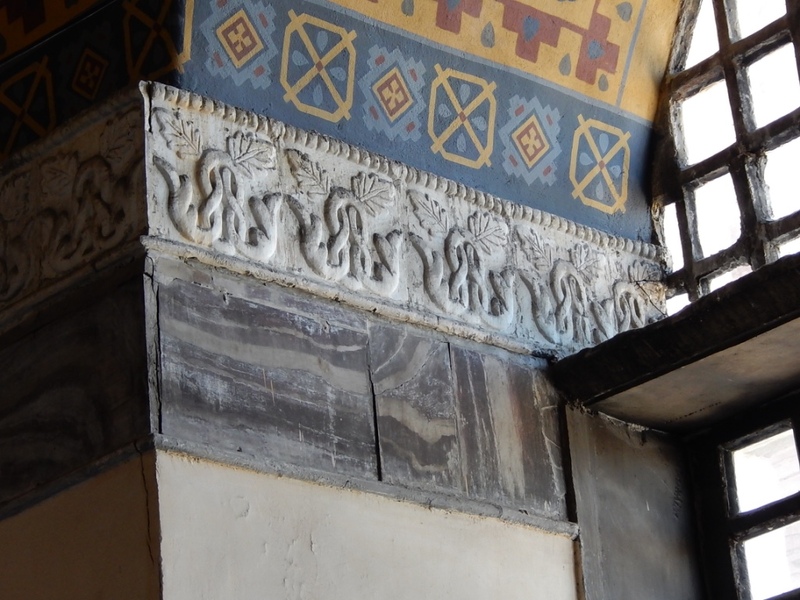 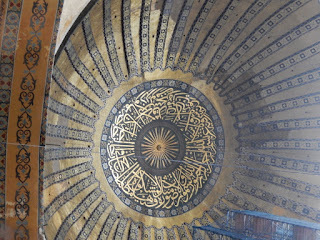 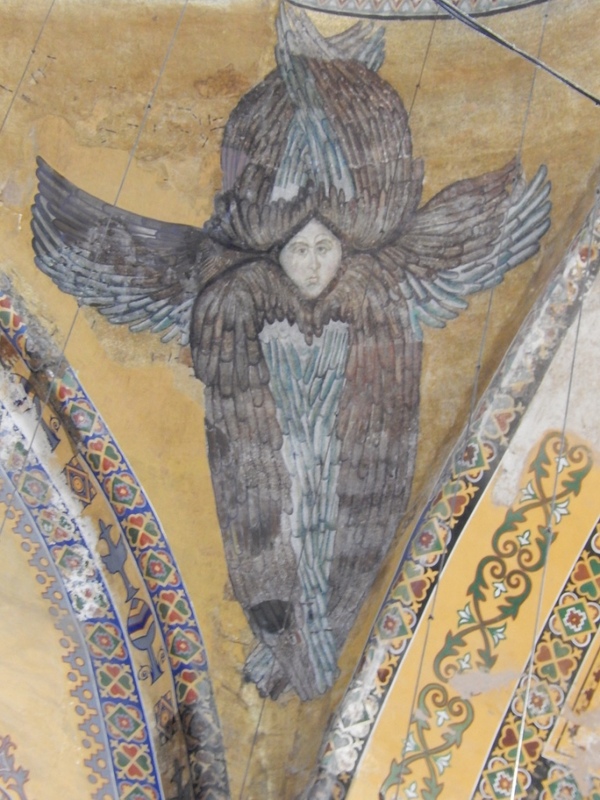 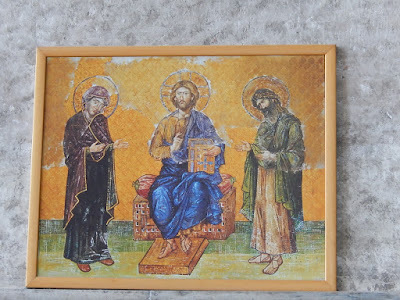 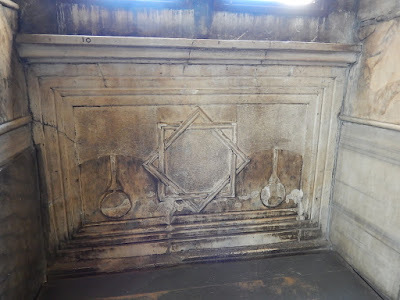 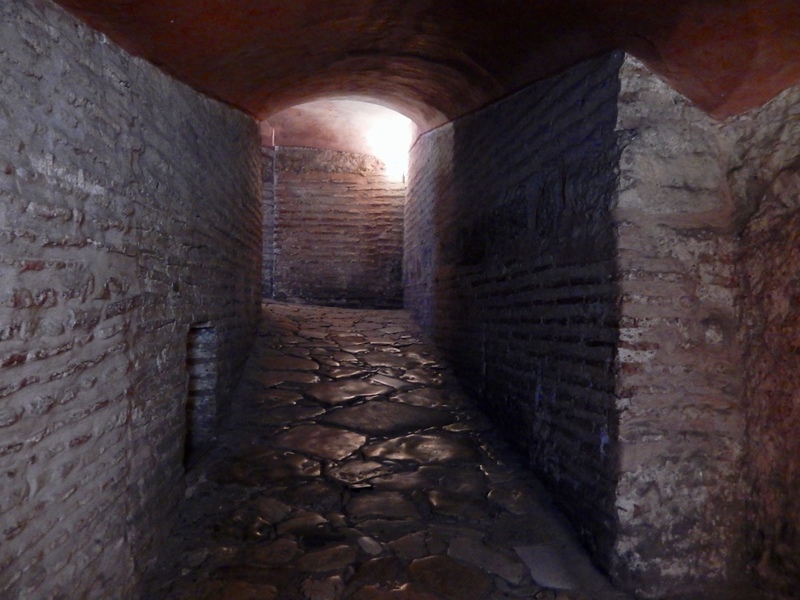 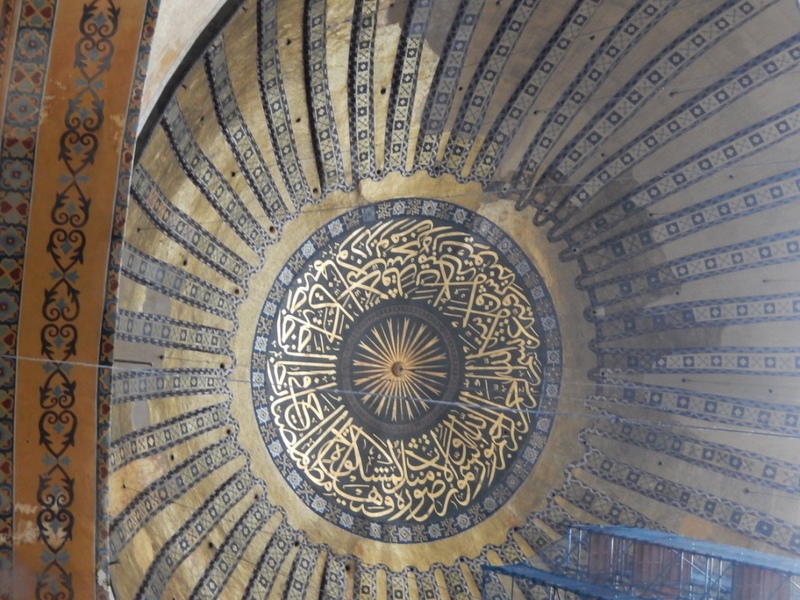 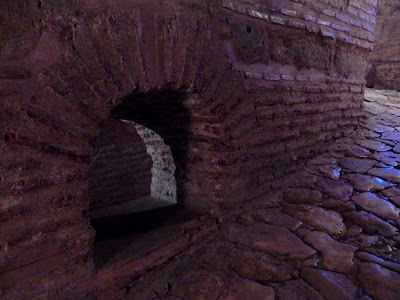 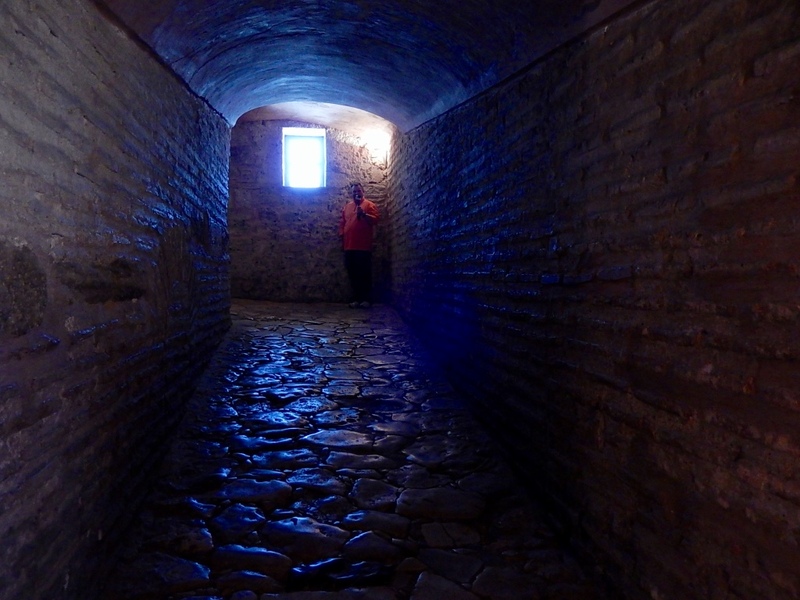 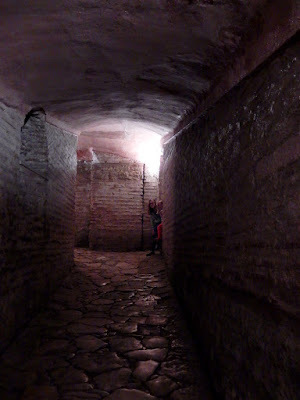 For more information here is a link: https://en.wikipedia.org/wiki/Hagia_Sophia. 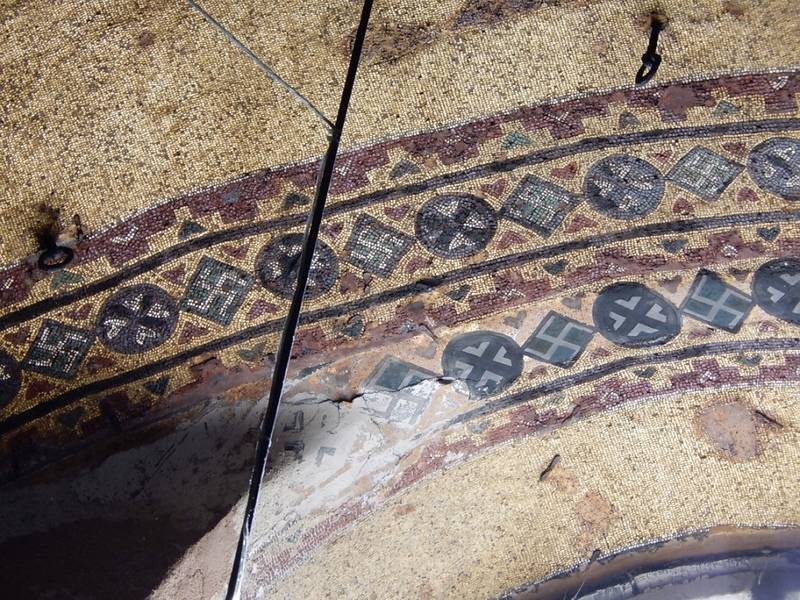 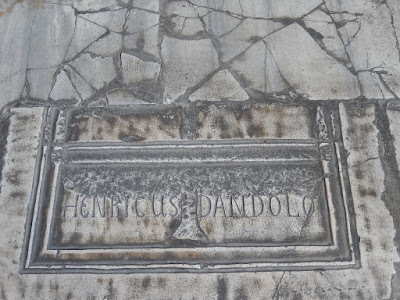 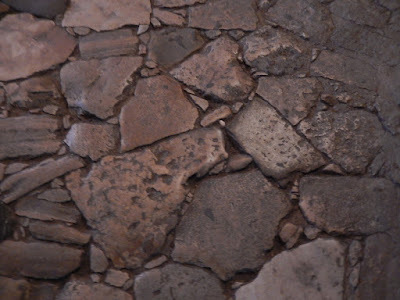 We found the tile mosaic markings very interesting. 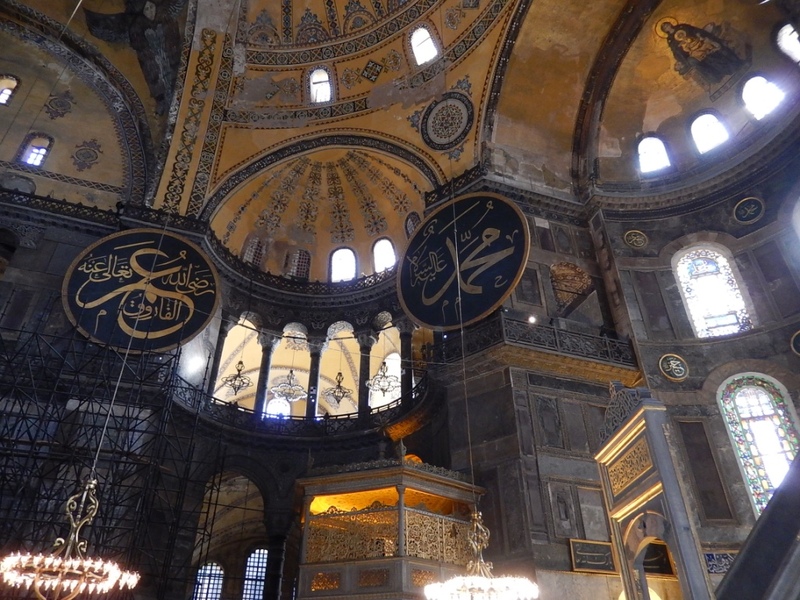 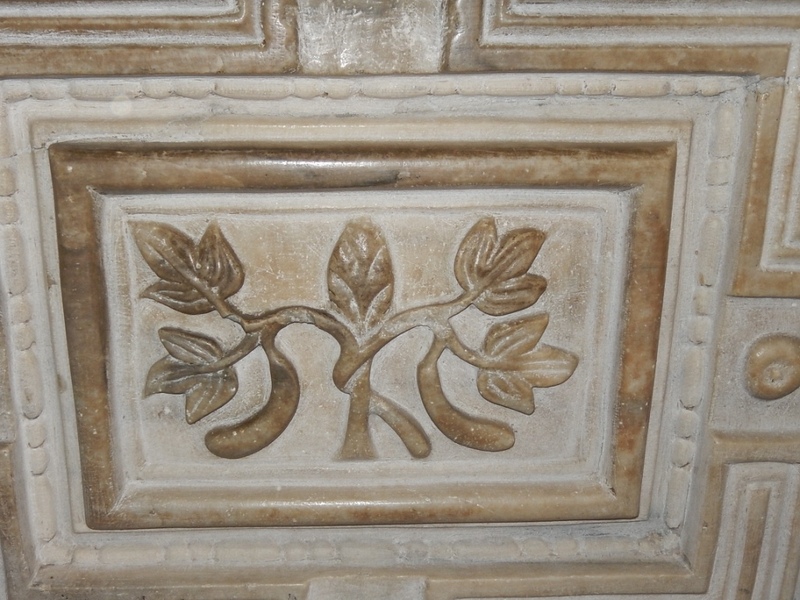 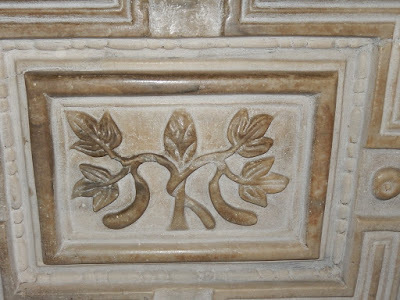 The Greek Orthodox church and the Buddhist faith have these symbols in their places of worship. 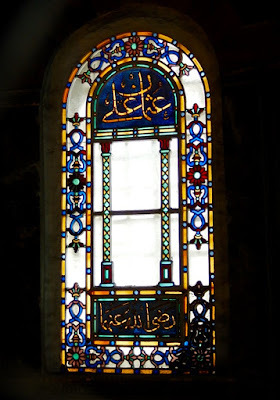 It is sad that they are now associated with hate, fascism and a horrible part of the worlds more modern history. 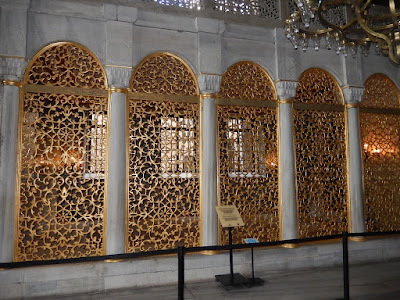 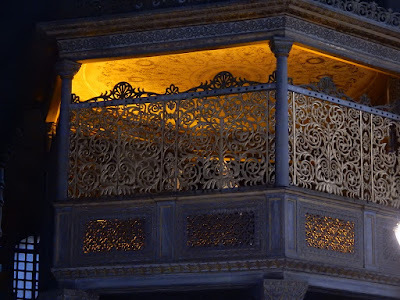 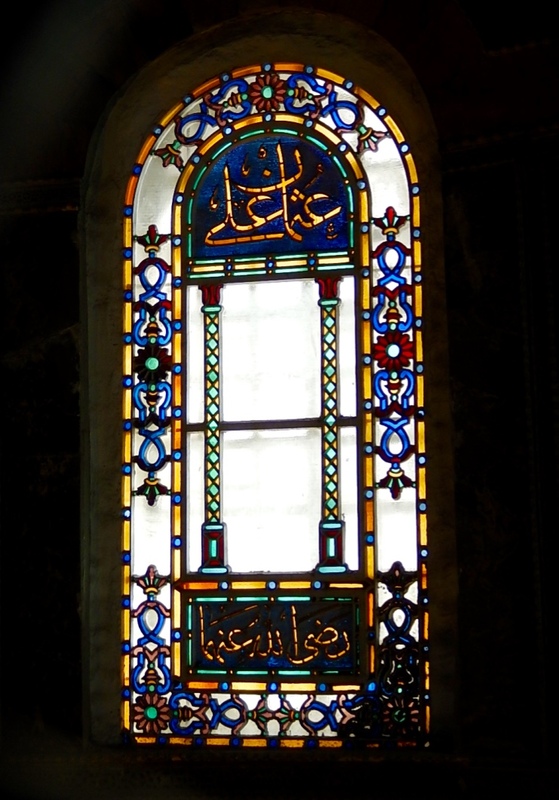 Sultan mAhmud I's Library - it has a Reading Room and Library (Hazine-I Kütüp). 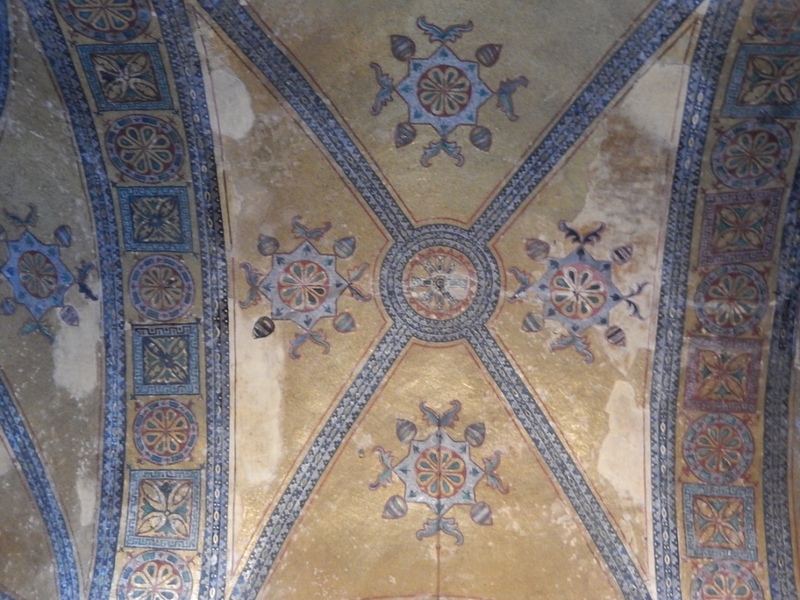 Decorated with16th and 18th century Iznik, Kütähya and Tekfur Palace tiles. It was built in 1739 by Sultan Muhamud I. 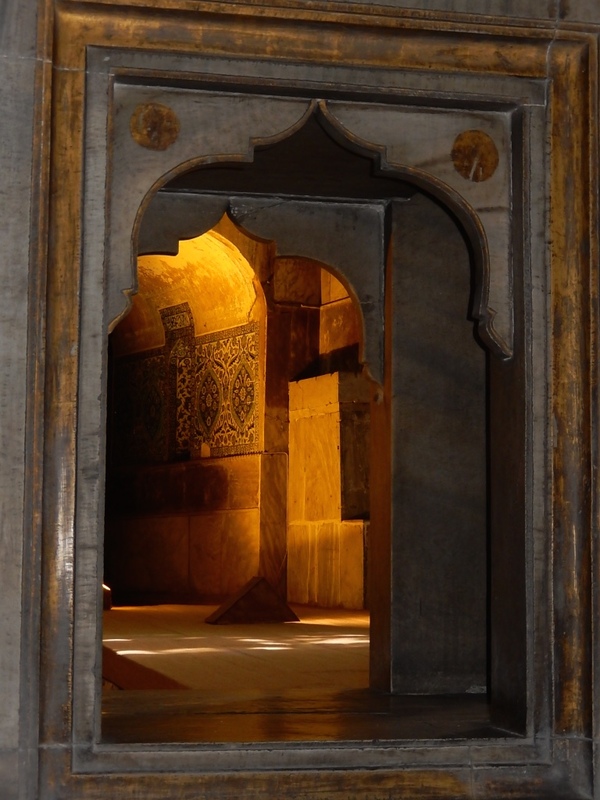 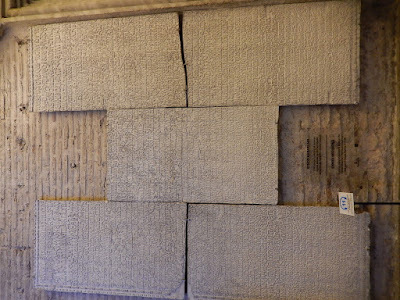 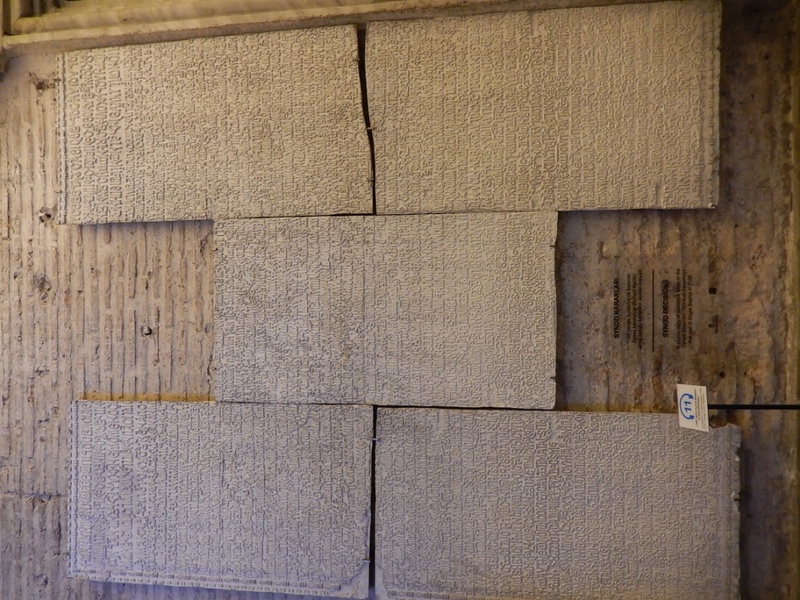 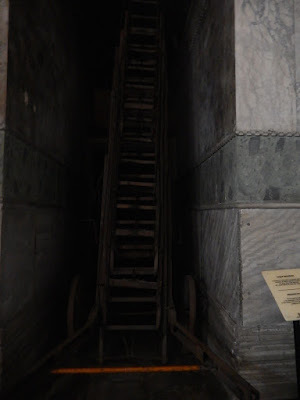 Wooden Stairs - Hand-made portable stairs used in the restoration and cleaning of the Ayasofya. 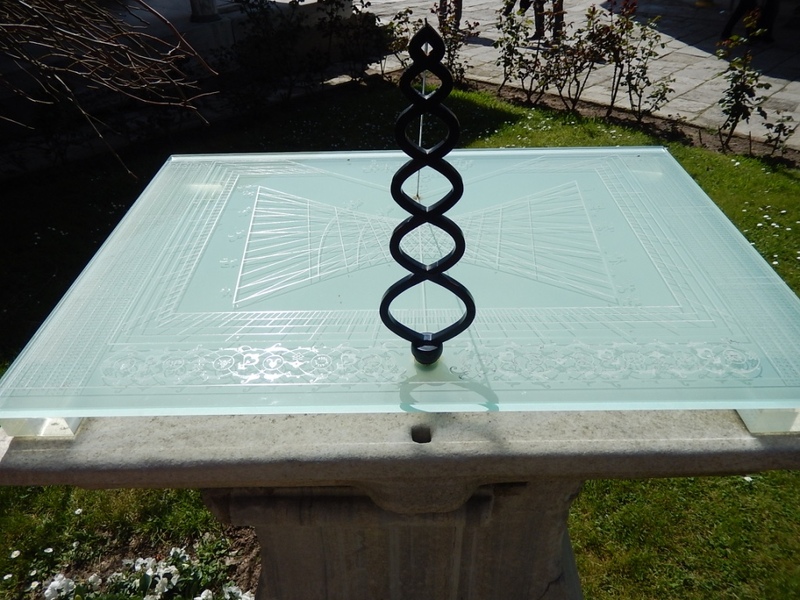 It was made in the late 19th century, with some later additions in the early 20th. 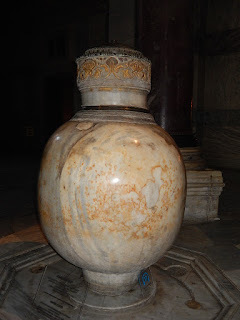 Marble jars - Marble jars were used on special days to distribute water and sherbet. It belongs to the Hellenistic Period (4-3 centuries BC) and is made of monolithic marble. 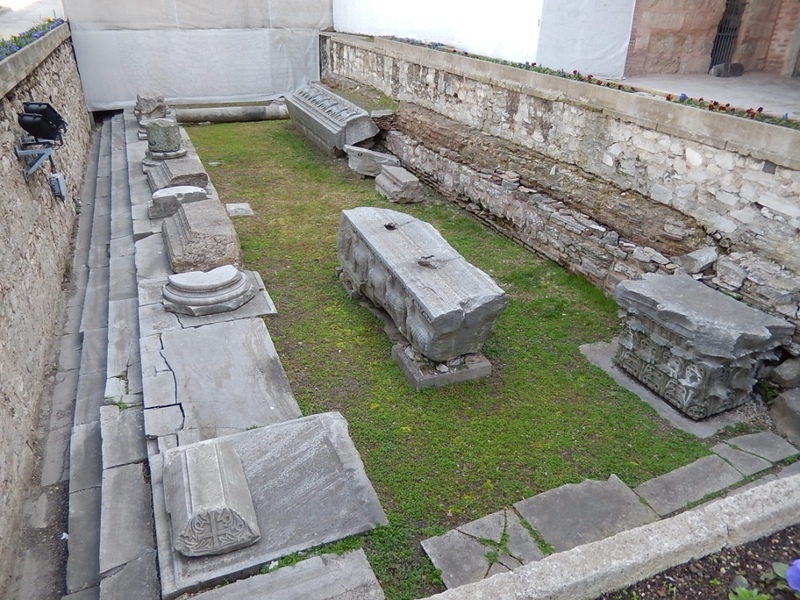 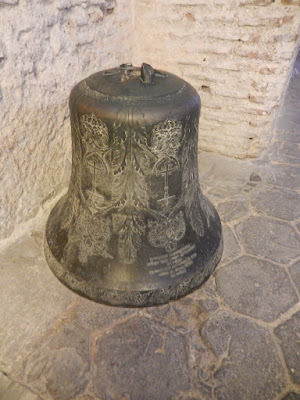 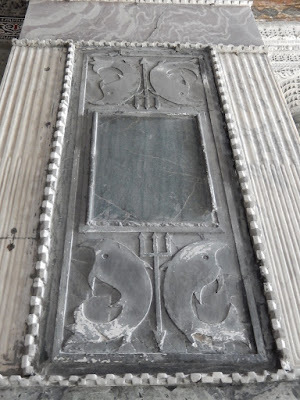 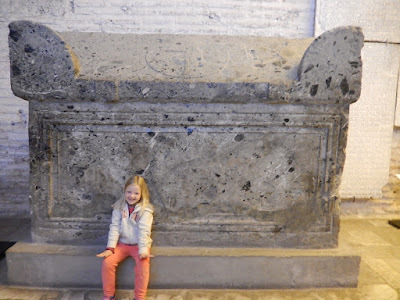 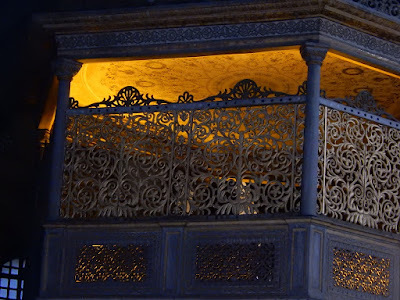 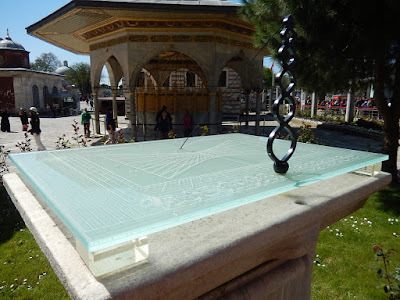 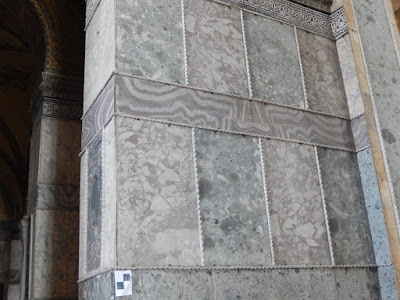 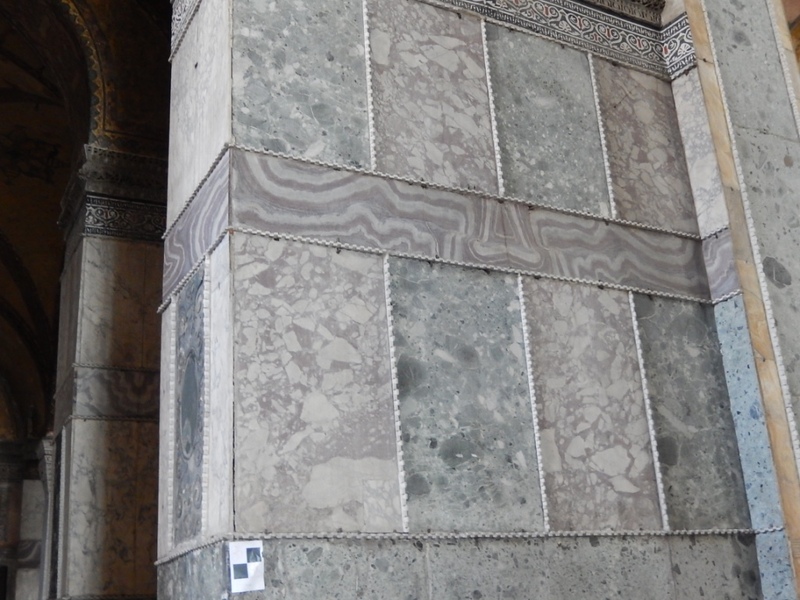 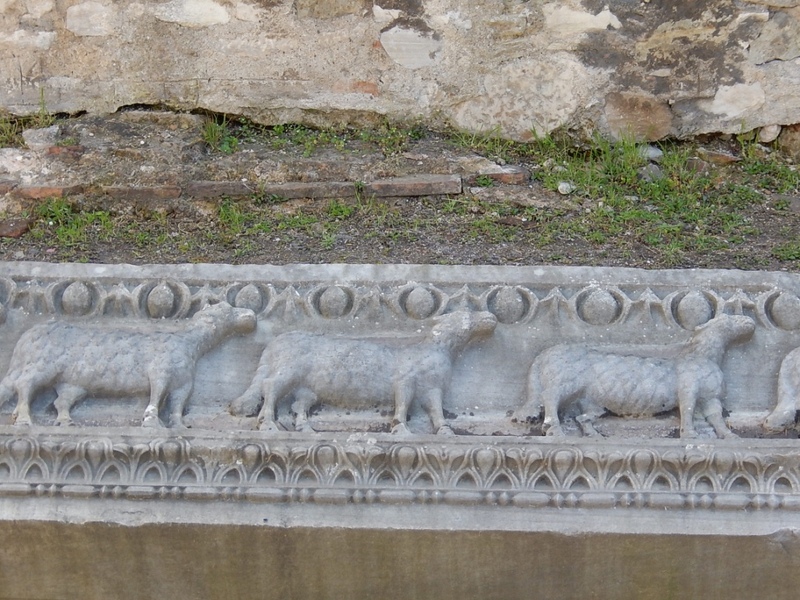 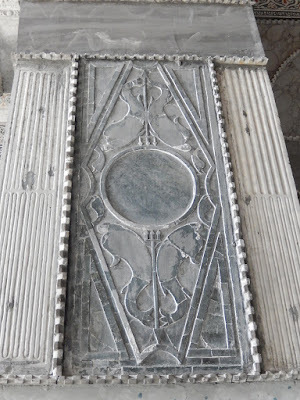 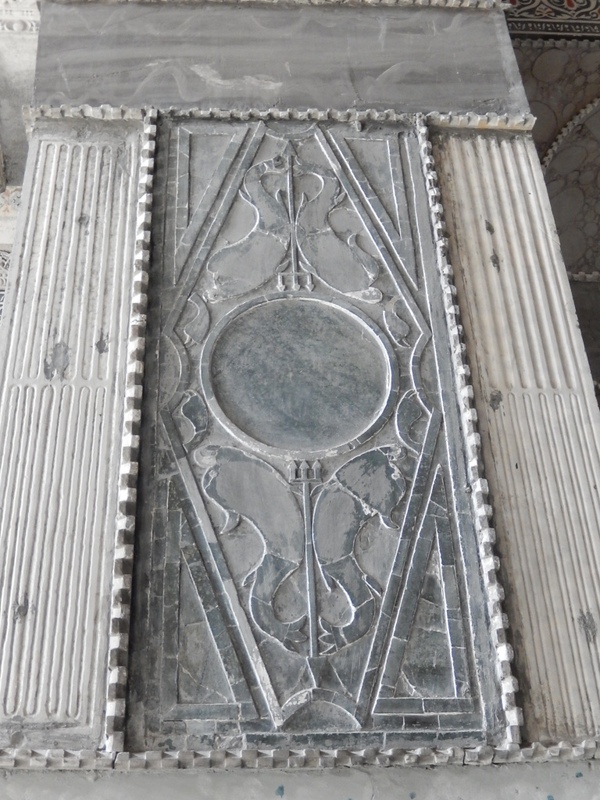 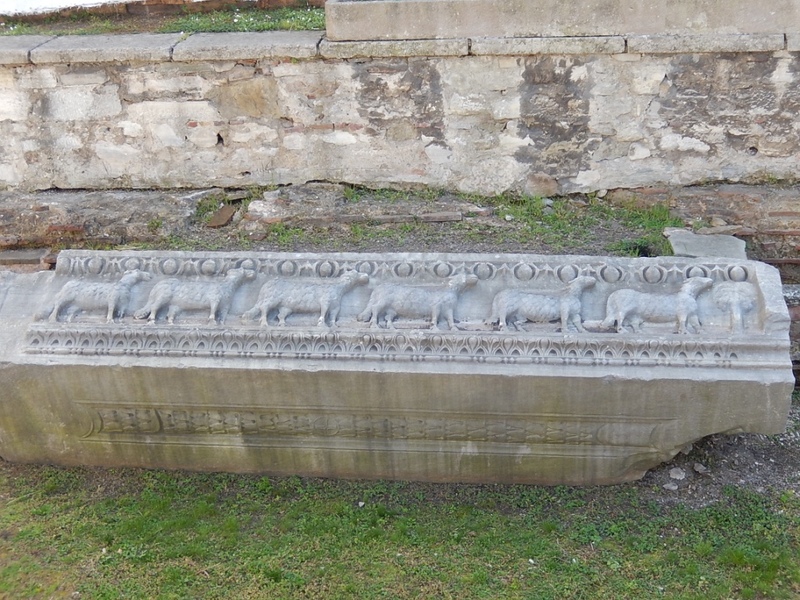 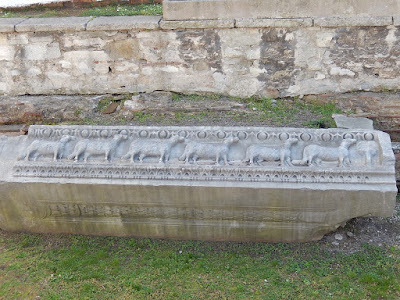 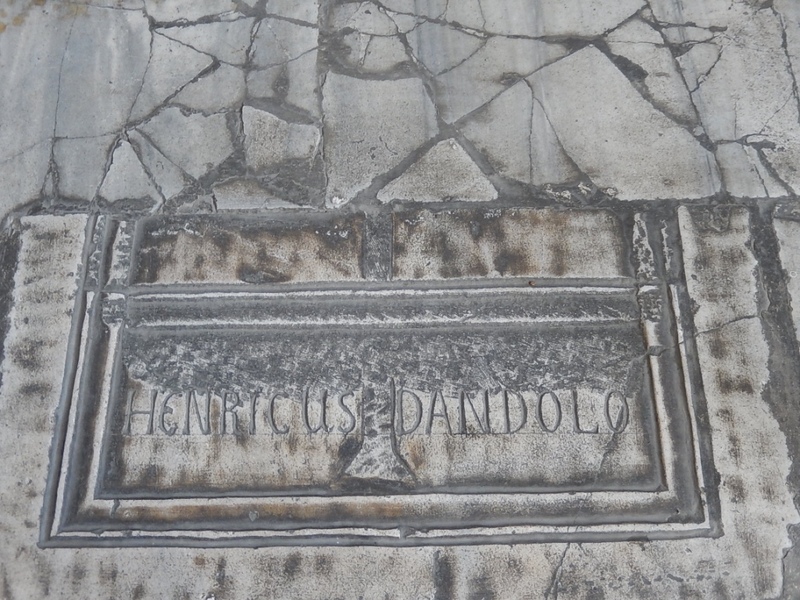 It was brought by Sultan Murad III (1574-1595) from ancient Pergamon. Mosaic panel 13th Century Deisis - Christ in the middle - John the Baptist on the right and Virgin Mary on the left. 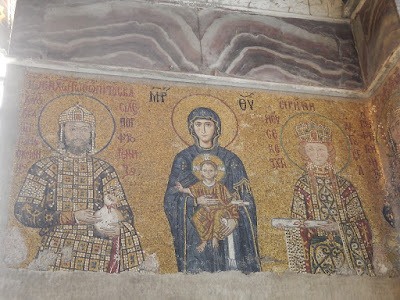 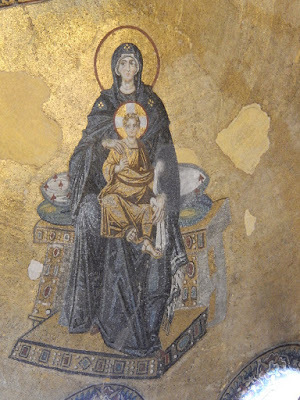 Mosaic Panel 12th Century - Virgin Mary in the middle, Child in her arms, Emperor John II Komnenos on the left, his wife the Empress Elrene on the right, their son Alexis above the buttress. 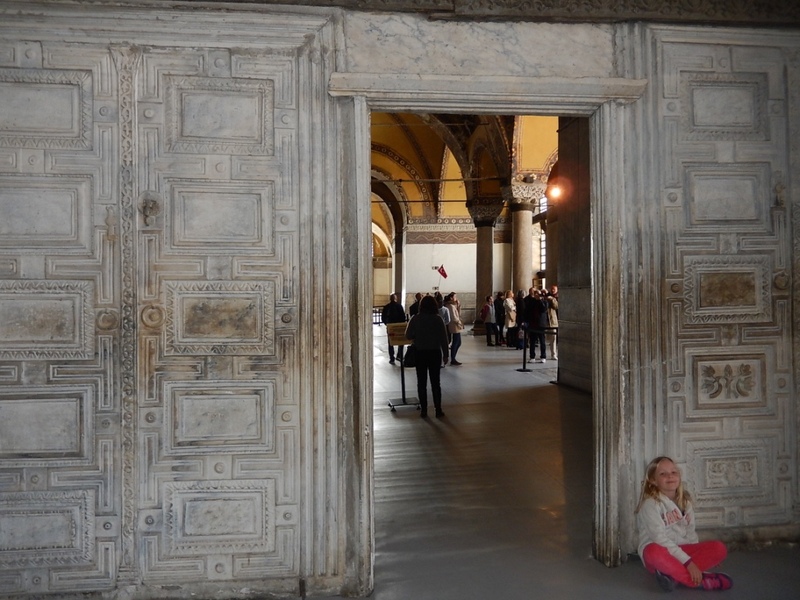 The Emperor and his wife donating money to the Hagia Sophia. 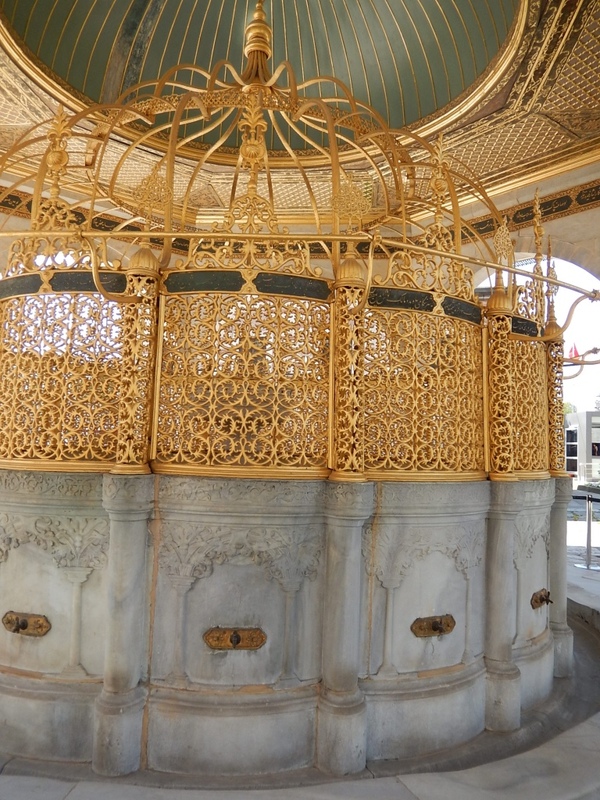 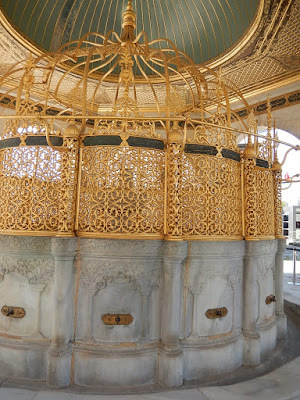 Fountain (Shadervan) - water facility built next to the mosques for ablution. It was built in 1740 in the period of Sultan Mahmud I. 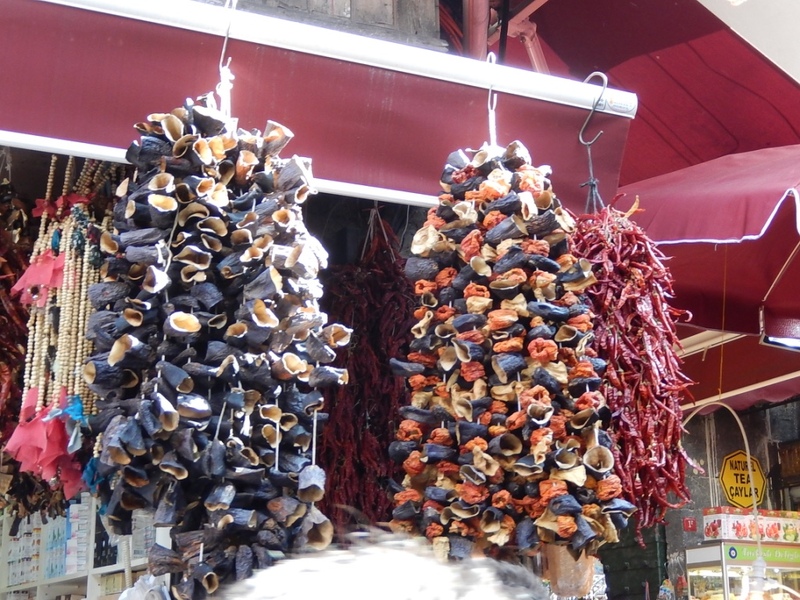 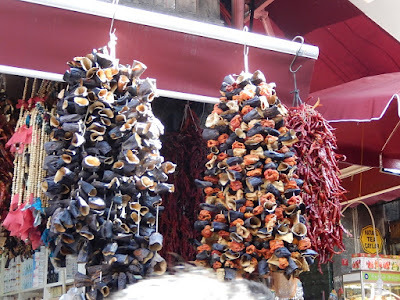 Later in the day we walked down to the spice market. 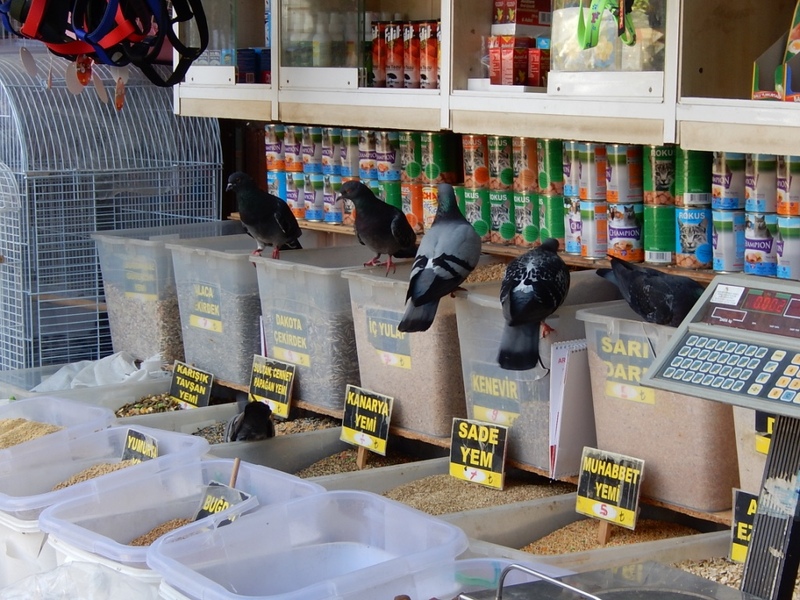 Before entering this area we noticed the pet Bazaar area. 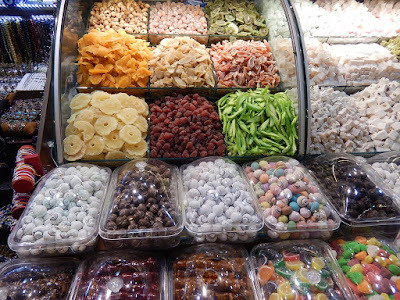 It comprises of many pet shops interspersed with plant/veggie shops. 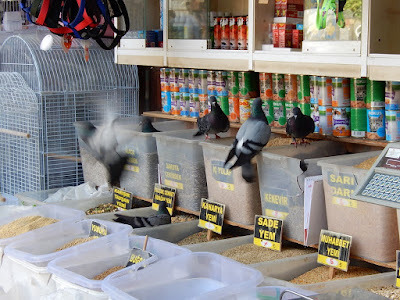 Paige noticed a pet store that had bulk bins of bird food that the pigeons were taking full advantage of. I could only go into one shop and see the animals. I find it hard to see them all waiting for homes but the hardest part for me is knowing that many will end up on the street or worse. It was an interesting experience none the less. 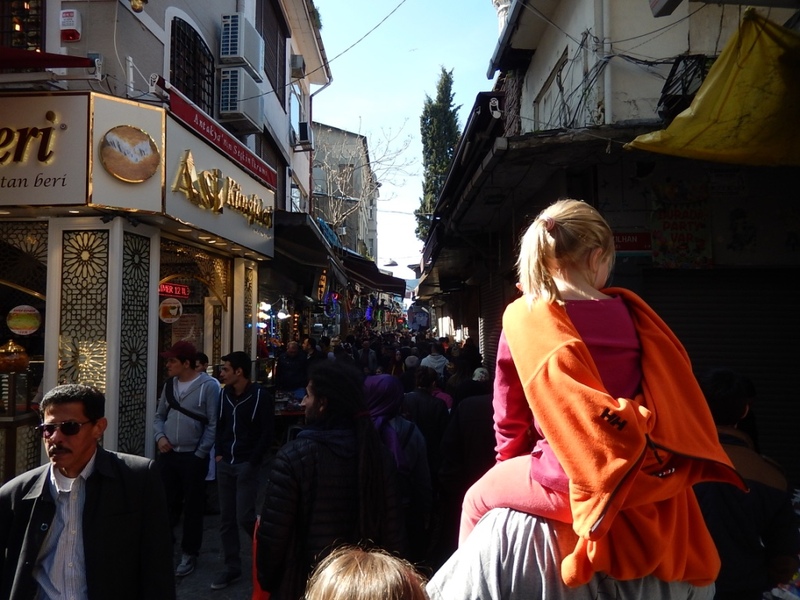 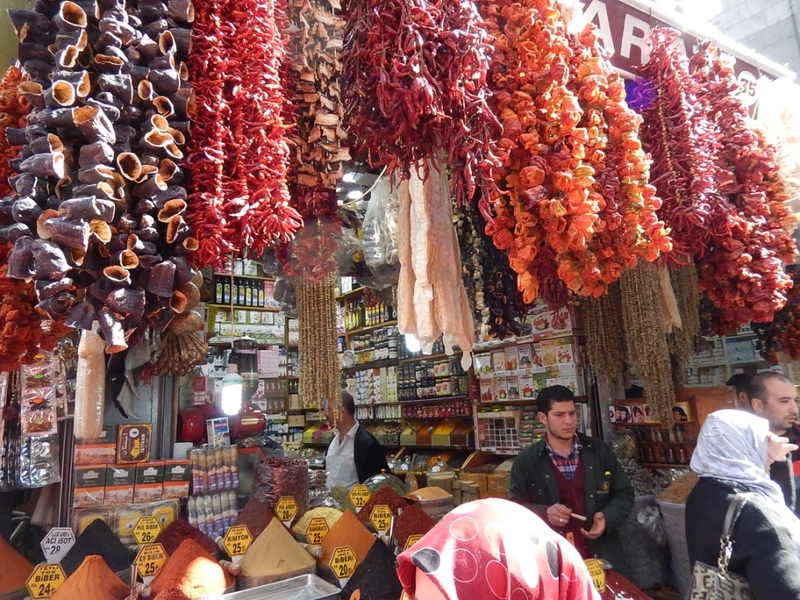 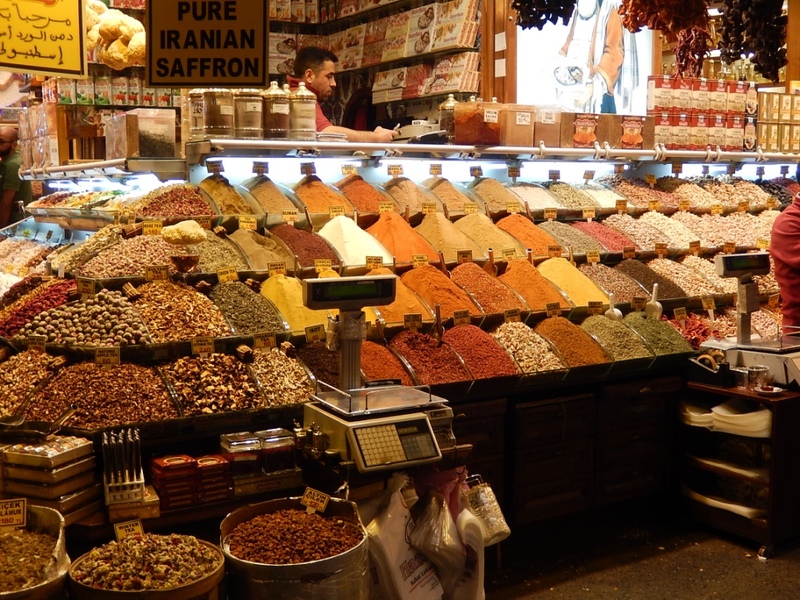 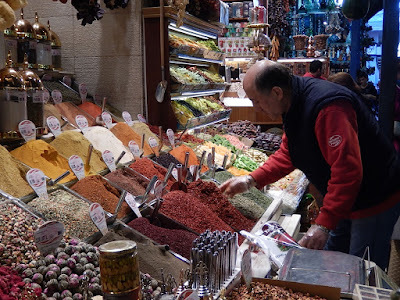 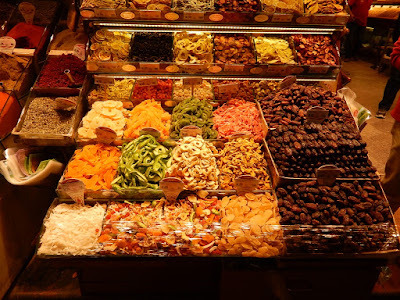 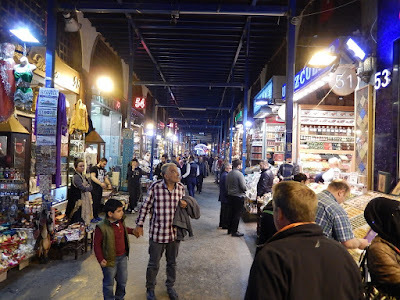 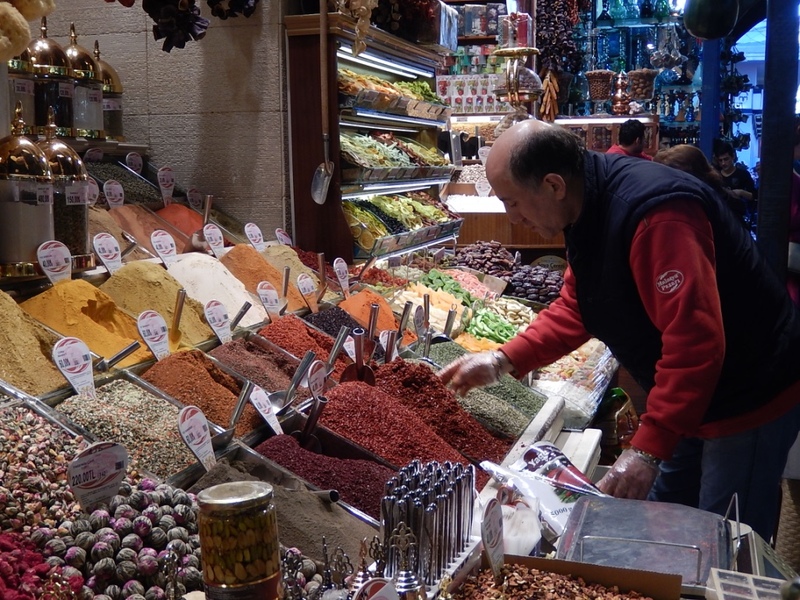 We then entered the spice market and noticed how crowded it was. 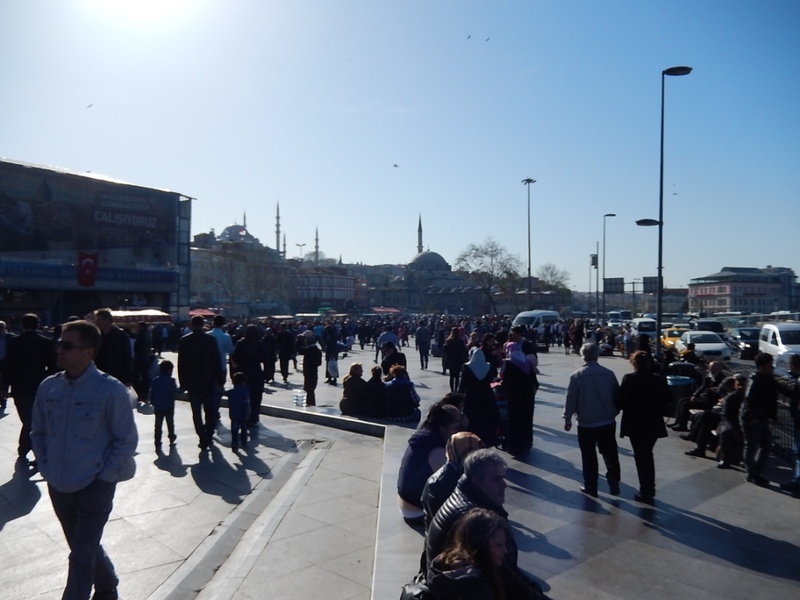 Not too many tourists but many Turkish people. 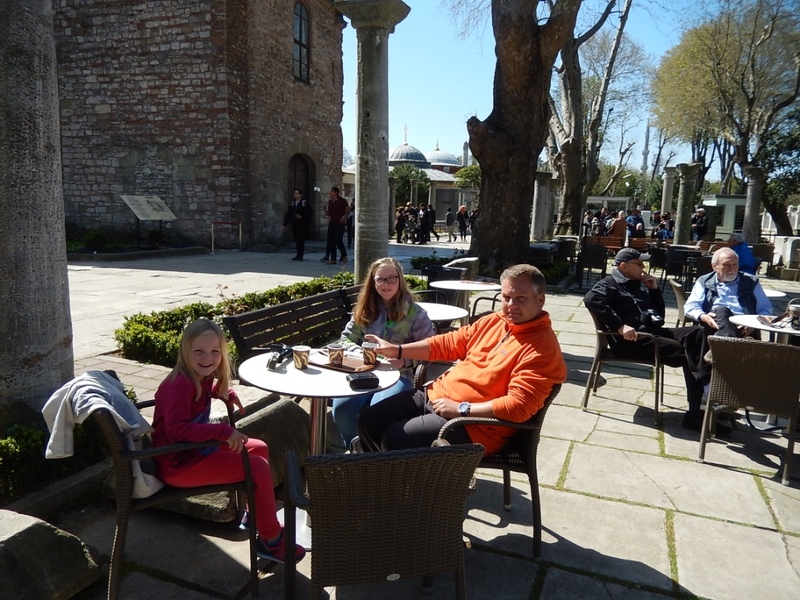 It was Sunday and many Turkish families use this day to spend time with their families. 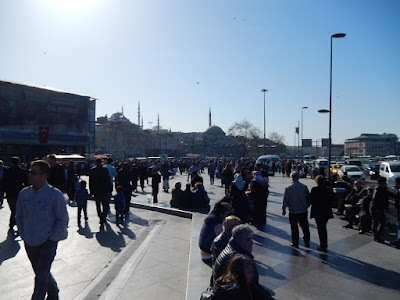 There was always police present wherever we went making us feel as safe as one can feel. There were tourists about but not as many due to the issues happening. 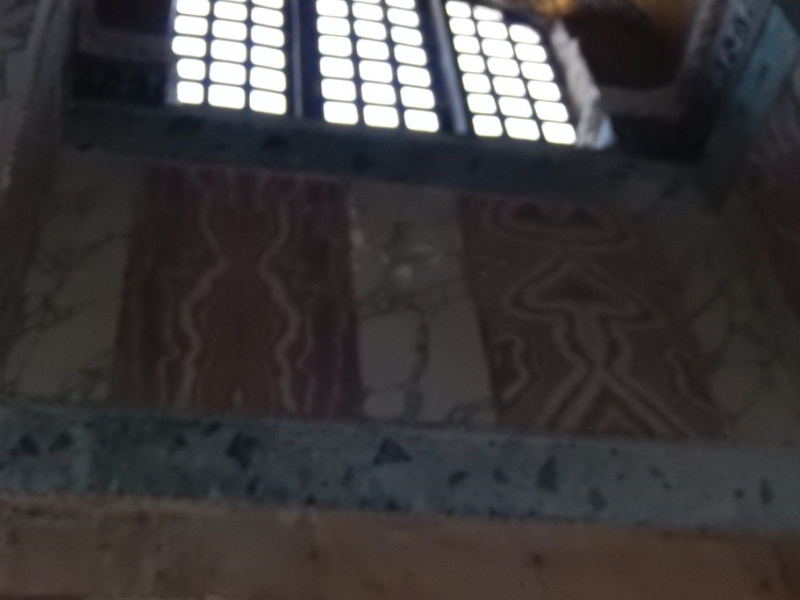 This made our visit pleasant as there were very few if any lines to see these sites.